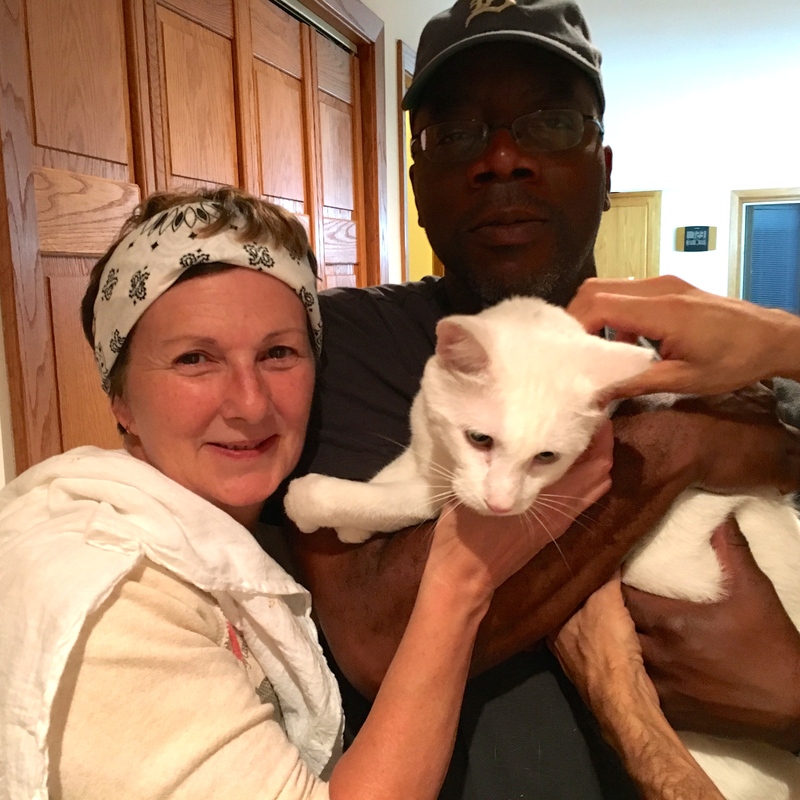 Back in April we helped Katarina find her lost declawed pet cat, Nico. 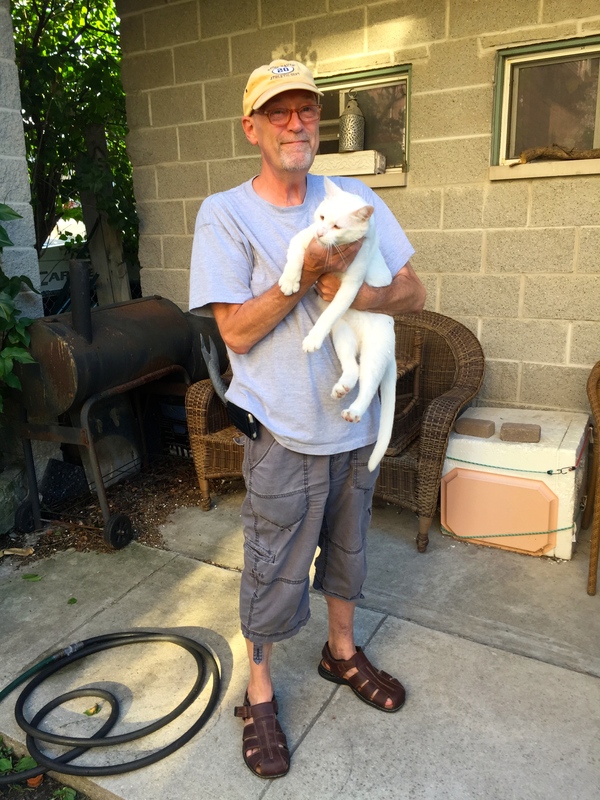 Another neighbor, Steve, eventually found Nico on his property. 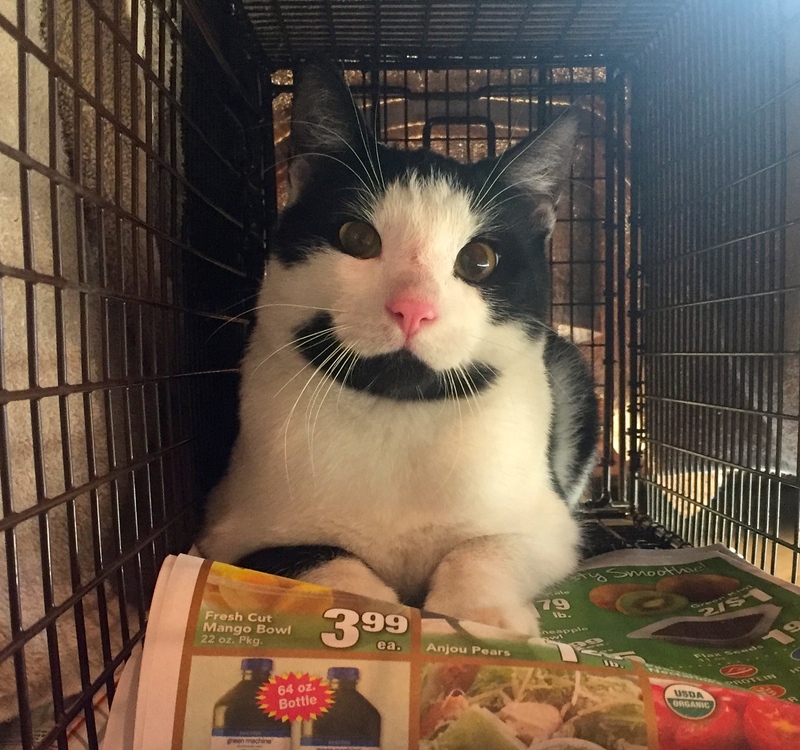 In the meantime we TNR’d two other cats while we set out traps for Nico. One of those cats was Bailey. 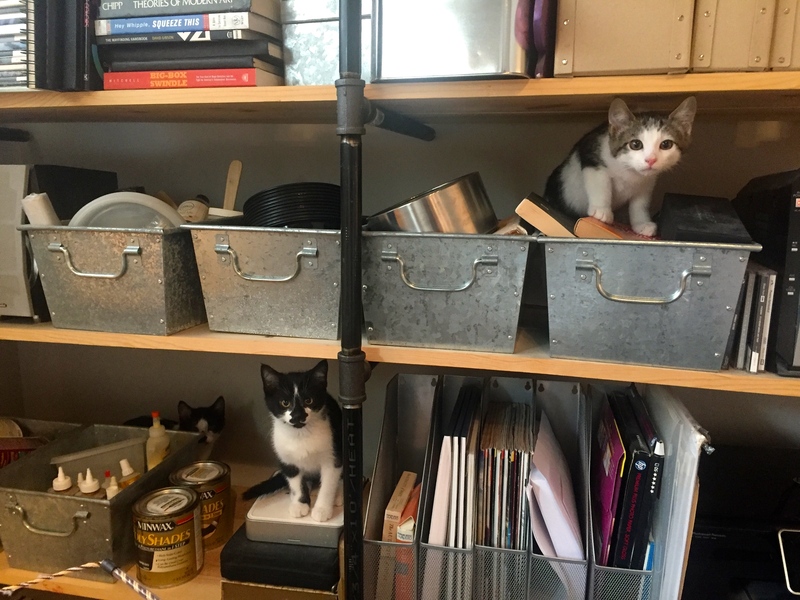 I wasn’t surprised to trap these other cats. 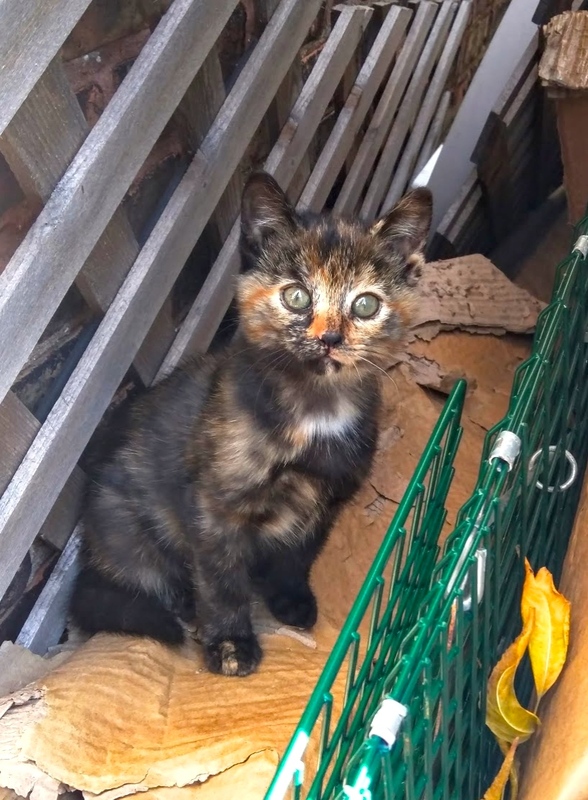 There are a lot of colonies in this area that I TNR’d and helped vet cats from, including the Cell Phones Colony and the Creole Colony, a hoarder home that has intact cats going in and out of constantly. Bailey seemed friendly, but he was scared stiff and would not move, so we returned him outside. Then in July, I got a call from a vet tracing Bailey’s microchip to me, who said Bailey was brought in with a wound on his leg. The person who brought Bailey to the vet was Steve, the man who found Nico! Steve took care of all of the vet bills for Bailey. He called Bailey, Mel, and said he has been hanging out in his yard since last winter. We think we now know which house Mel came from and those neighbors left him when they moved, but Mel was acting feral at first. Steve had been trying to TNR him also, but then Mel showed up with the tell-tale ear tip from when we TNR’d him. 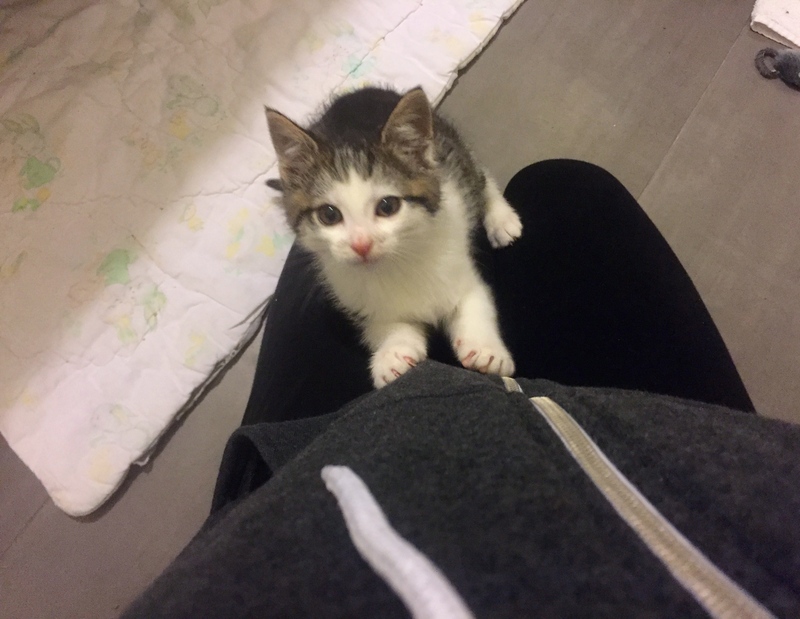 And as the hormones left his body from being neutered, Mel became more and more friendly. Really friendly. 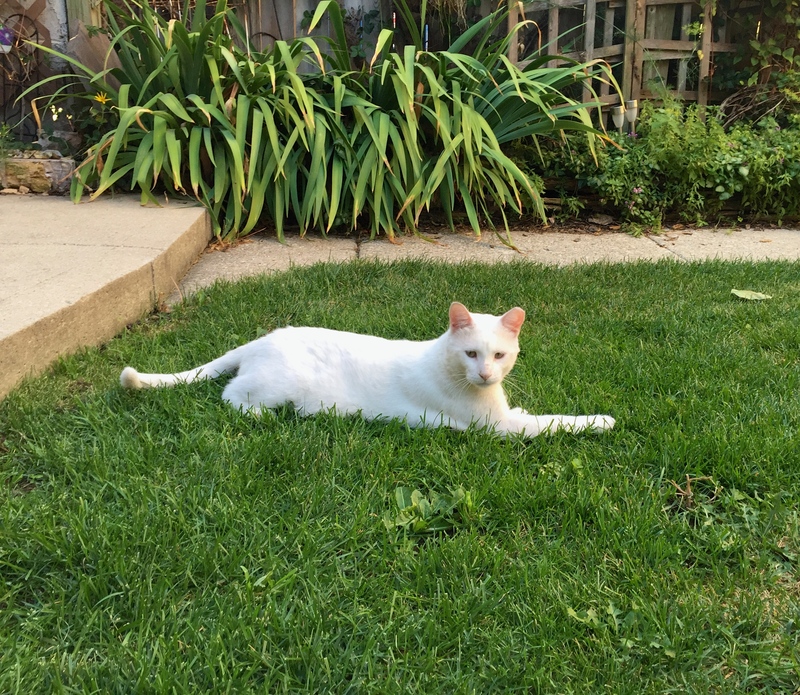 Check him out in Steve’s gorgeous outdoor patio. And as you can see, Mel’s white coat is now whiter than ever. 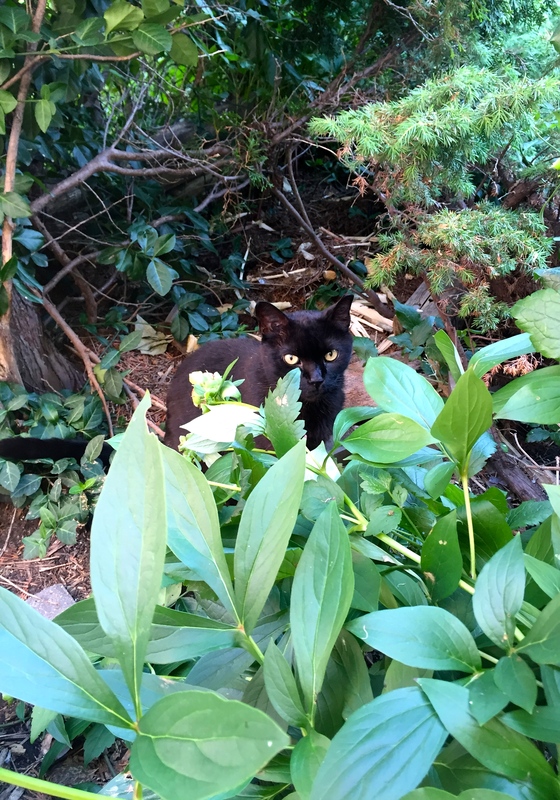 Mel hung out with Steve’s two black colony cats, although they didn’t all exactly get along. The difference was that Mel now allowed Steve to handle him. 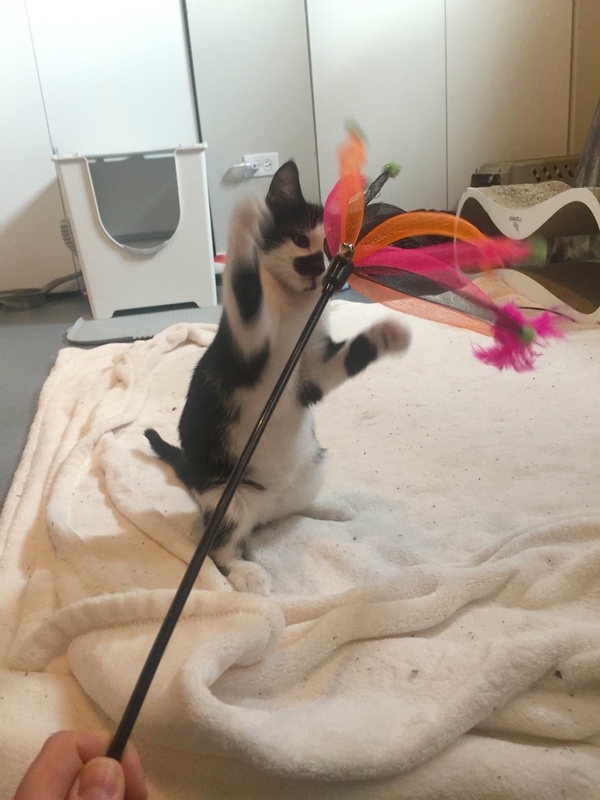 So Steve asked around and eventually found Mel a home with two other friends, where he continues to do well and enjoys being back indoors. Thank you for all that you do, Steve! I’m so grateful to have met yet another animal-loving neighbor! 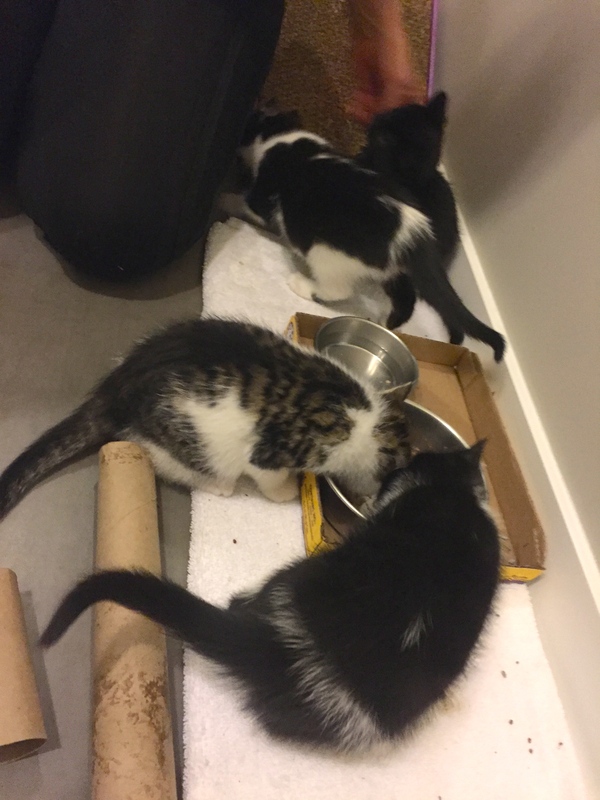 TNR is all about networking with your neighbors to help the community cats, and microchipping helps even more. Otherwise I would never have know what happened to Bailey, aka Mel. On the second early morning of trapping the Charlie Chaplin Colony, Cowbella came wobbling and stumbling up to Melanie’s yard. Kim and I knew immediately something was wrong with her because of the way she was moving. Luckily, Cowbella pretty much went into a trap immediately because she was hungry. Kim took her straight to our friend, Dr. James Harris, at Elmhurst Animal Care Center. 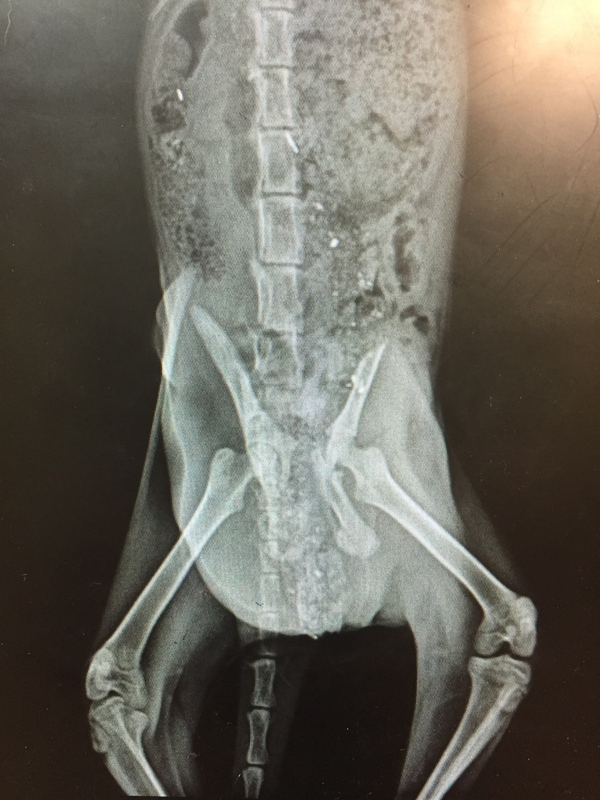 According to Dr. Harris, Cowbella has “a nasty pelvic fracture, that doesn’t seem super painful, and not much can be done surgically. She’ll likely be functional in the long run but will never walk right.” Here’s her x-ray. He recommended she rest for about two and a half months, giving a chance for her bones to mend on their own. She should not be spayed until then either. Kim set her up in a dog crate in her house to rest. This presents a conundrum as so far Cowbella is acting feral. 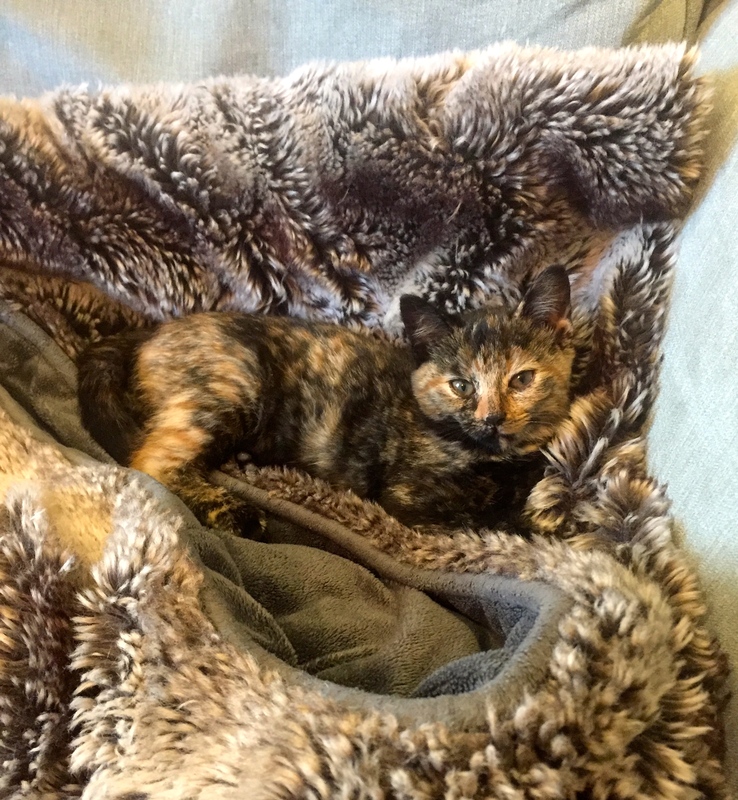 Even if she stays inside for a few months until she can be spayed, she will have to definitely stay inside until spring because she won’t have her winter fur coat anymore to keep her warm. Even then, putting her back out after being inside for that long isn’t really an option. Cowbella is only about 5-6 months old – she’s not old enough to have her environment imprinted on her and remember it months later. Most likely she’ll just get used to the dog crate, which isn’t much of a life either, except for short term. Also, we’re not sure how fast she can run to defend herself. Even worse, there’s a chance that she may not be using her back legs at all any more and is paralyzed. 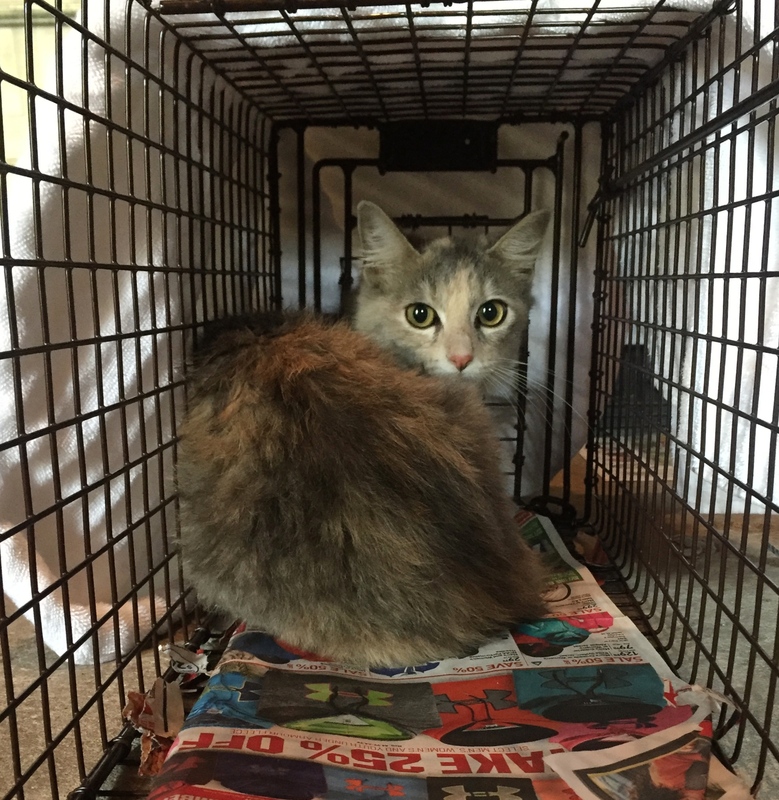 We think we may have trapped very soon after getting hit by a car, perhaps, and her body was still working. It is hard to tell as she does not move in front of us. 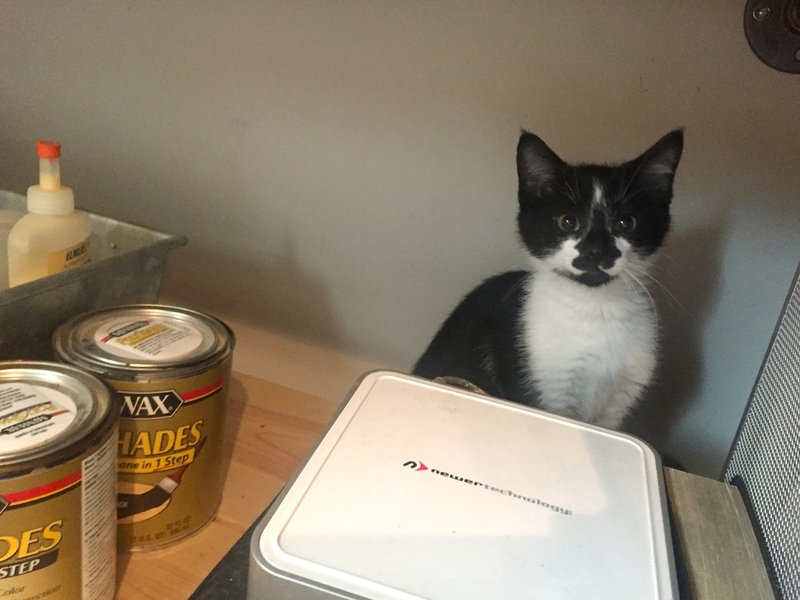 But when we leave, she is eating, sometimes using the litter box, and sometimes just defecating on the papers. We can’t really get her to move so we’re looking to borrow a camera for the room. We are grateful to Melanie for covering Cowbella’s care so far. 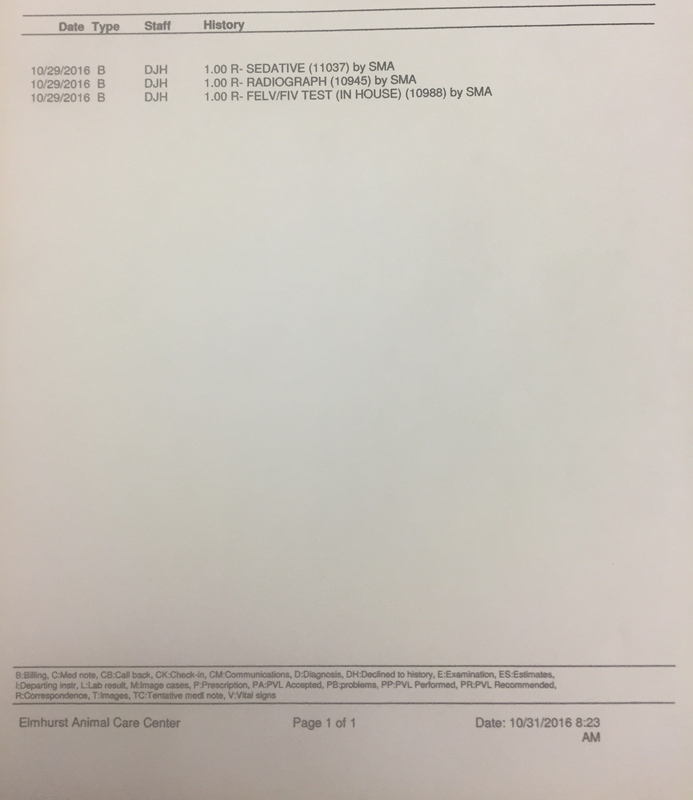 Dr. Harris and the Elmhurst Animal Care Center are excellent and affordable. 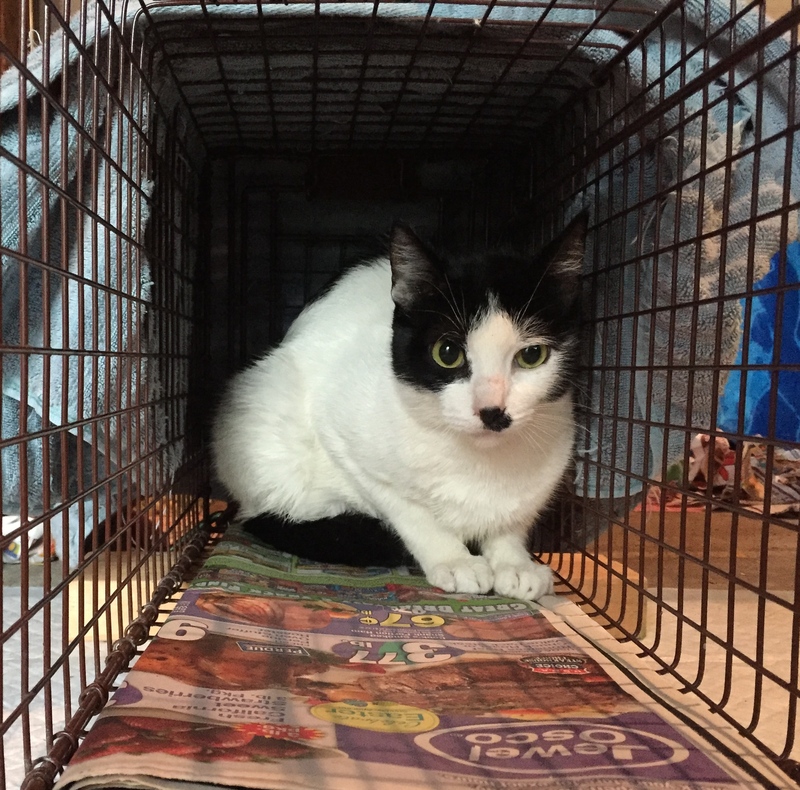 Along with the x-ray, we tested Cowbella for FIV/FeLV and she is negative. The total bill for her so far is $105. 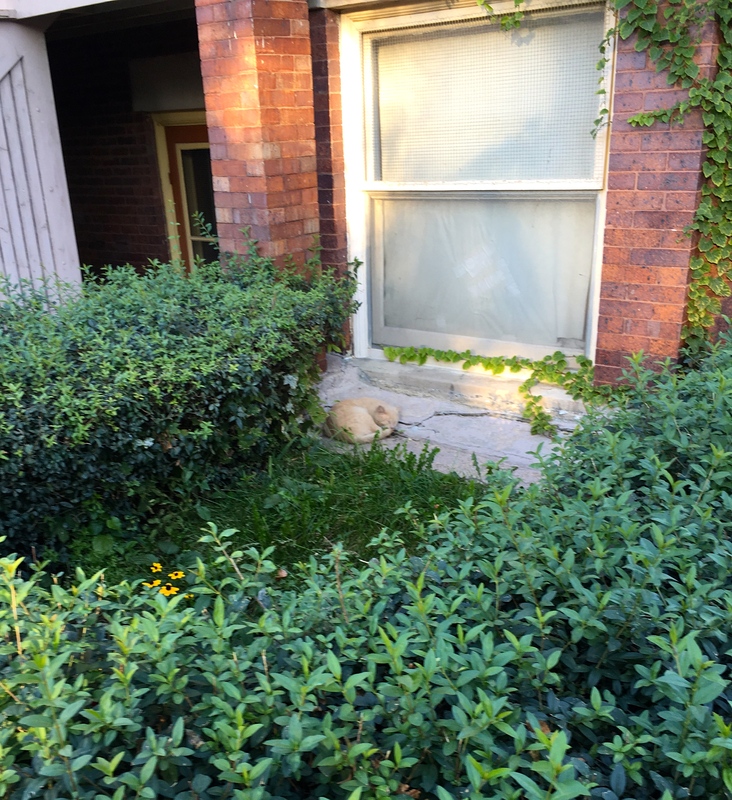 Melanie emailed me mid-October looking for help for the cats on her block in Avondale. 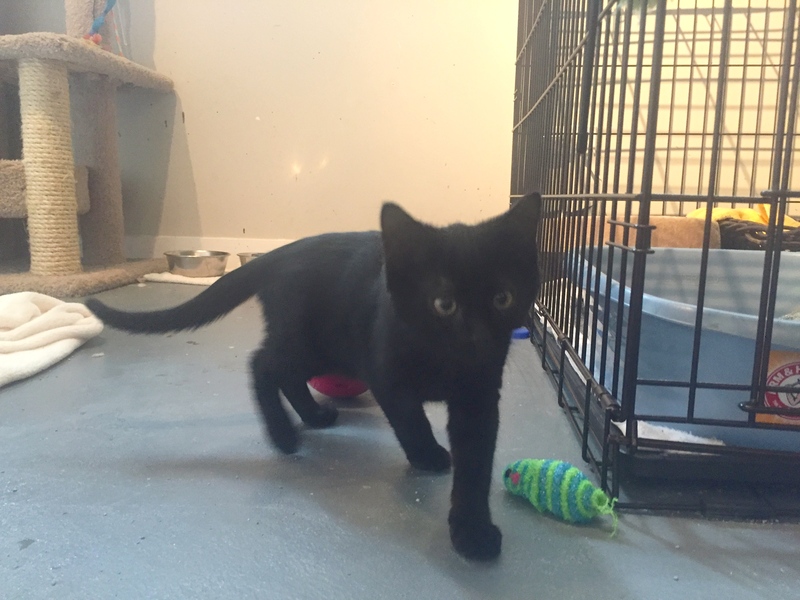 When I looked up her address I knew we HAD to help her – she lived just a few blocks from my rescue partner, Kim, and three other colonies we did this summer: the Big Daddy Colony, the Polska Kittens Colony, and the Wild Wild West Colony. Coincidence? Nope. This area has a huge cat overpopulation problem but it can be contained with diligent, consistent TNR and colony management. We’re already well on our way. 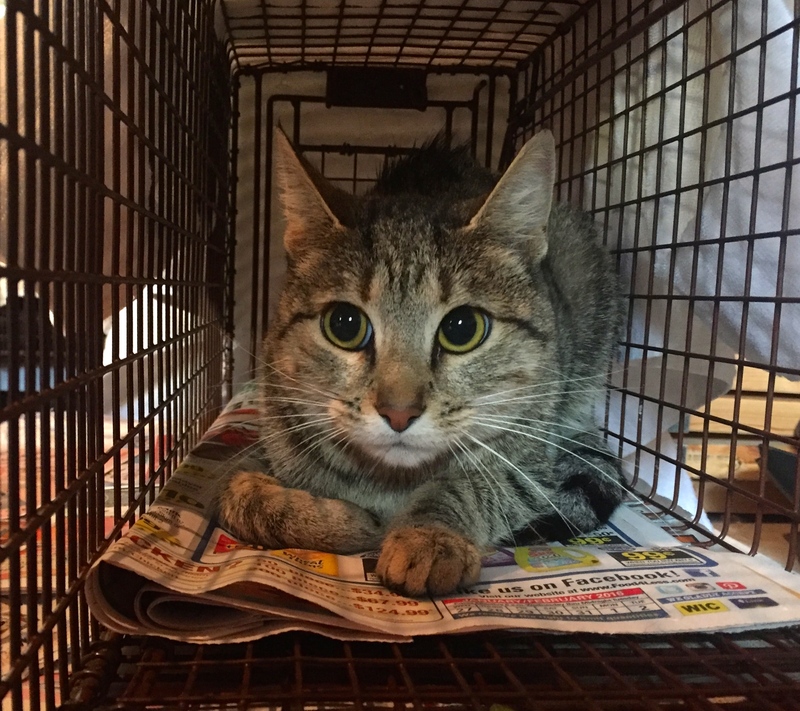 About 30% of the cats we trapped this summer from here were admitted into no-kill shelters. Melanie estimated were 7-10 cats coming to her yard, but she knew there could be more. She also knew there was a mama cat and kittens, because they visited at one point recently. 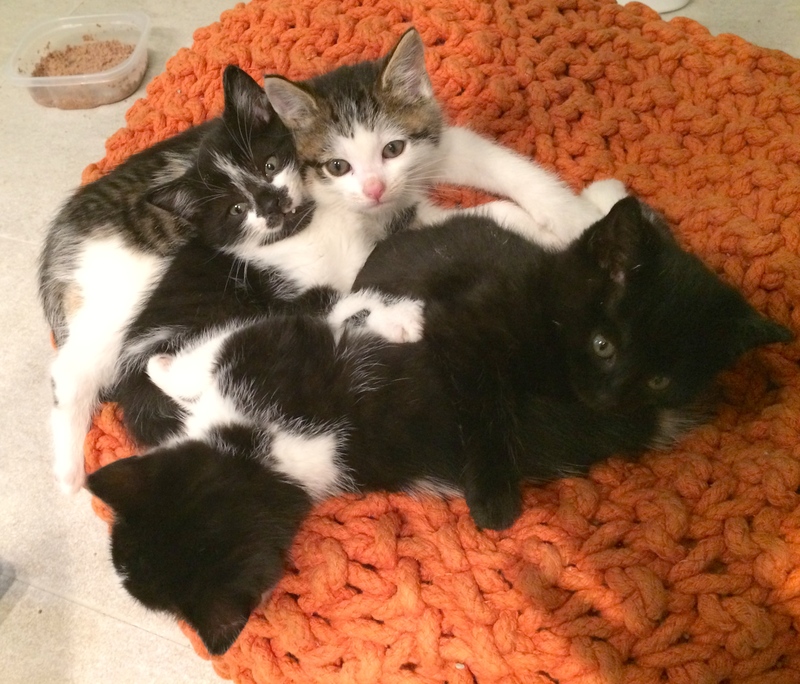 That means the kittens were just weaned. When she inquired about the costs, Melanie offered to sponsor any care as needed. 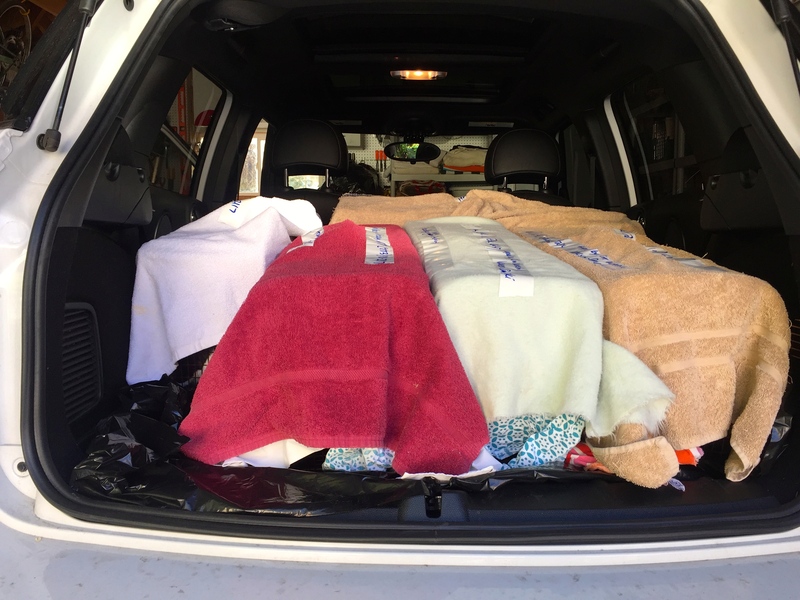 She just lost her beloved pet cat, Lumpy, very recently, and wanted to continue the care of the outdoor cats in her honor. Just look at beautiful Lumpy. As Melanie explained, “Not to brag, but she was the funniest, chattiest, softest, best beast on the entire planet. Sigh. I miss her terribly. 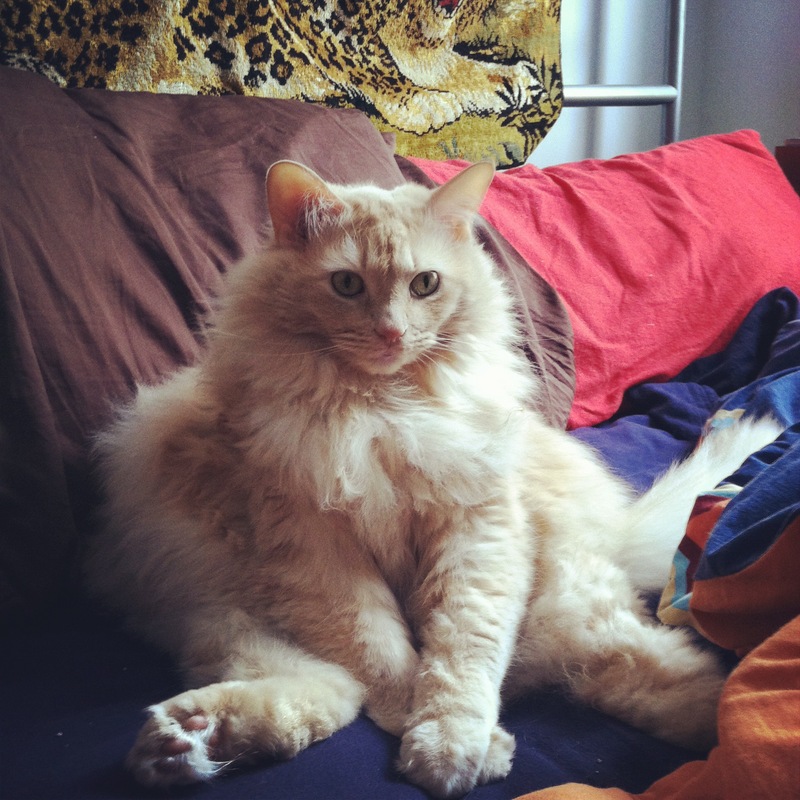 And yes, she would always sit like this. The best!” We agree! She was gorgeous! 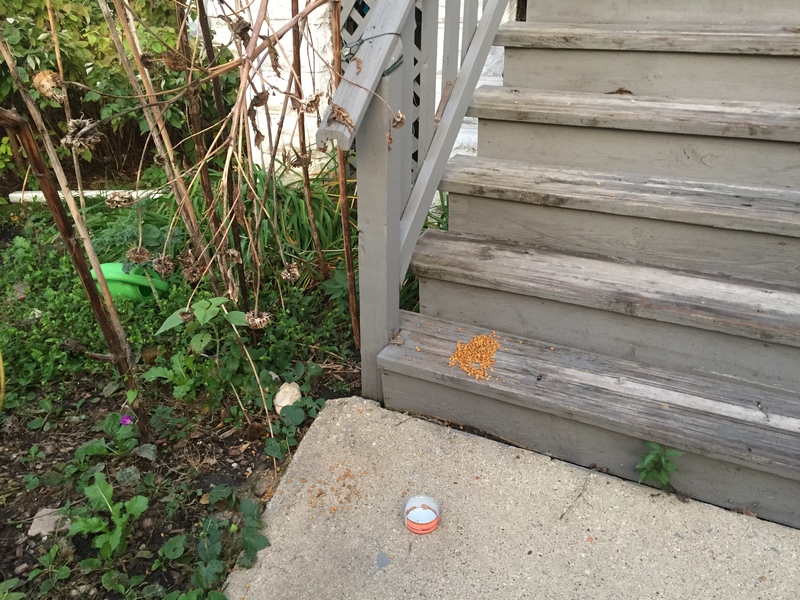 Melanie told Kim and I that an elderly Polish neighbor left cat food every morning in her front yard, which is why the cats were congregating their in the first place. We asked her to communicate as best as she could with everyone to stop feeding the cats for a day or two. She didn’t know who the Polish lady was,… yet. 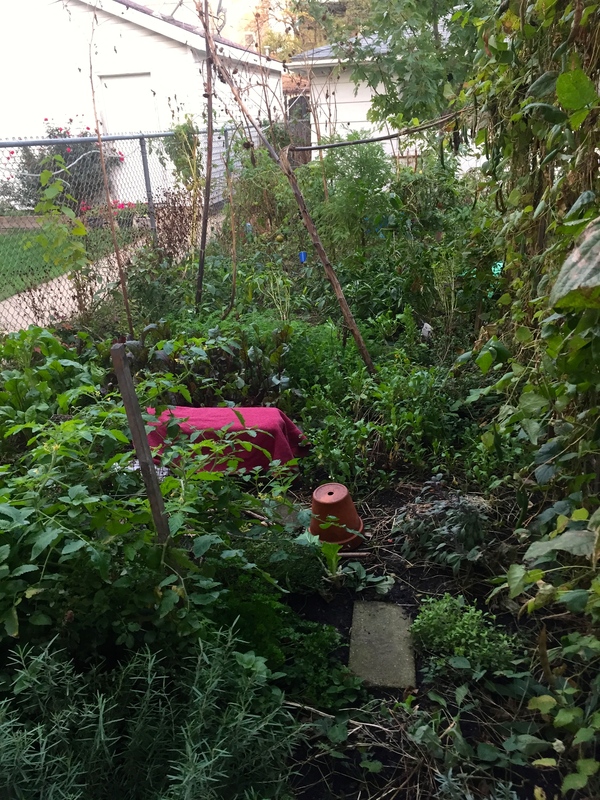 When we arrived as planned at 5am on a Friday morning, we saw the food on her front steps. We threw out the food, and set up the traps regardless. 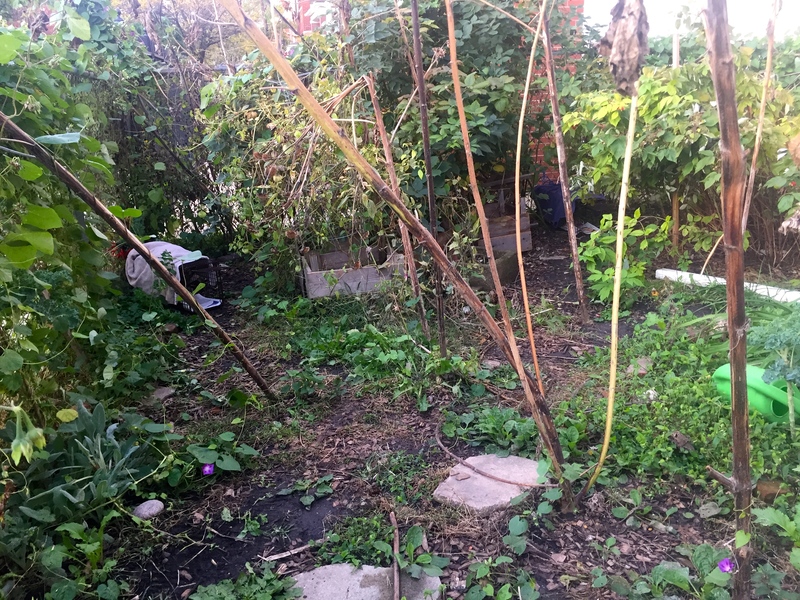 Melanie has a beautiful yard and garden, perfect for the cats to hang out and hide in. And perfect to keep traps hidden in. We set up traps in her front yard. And we set up traps in her back yard. 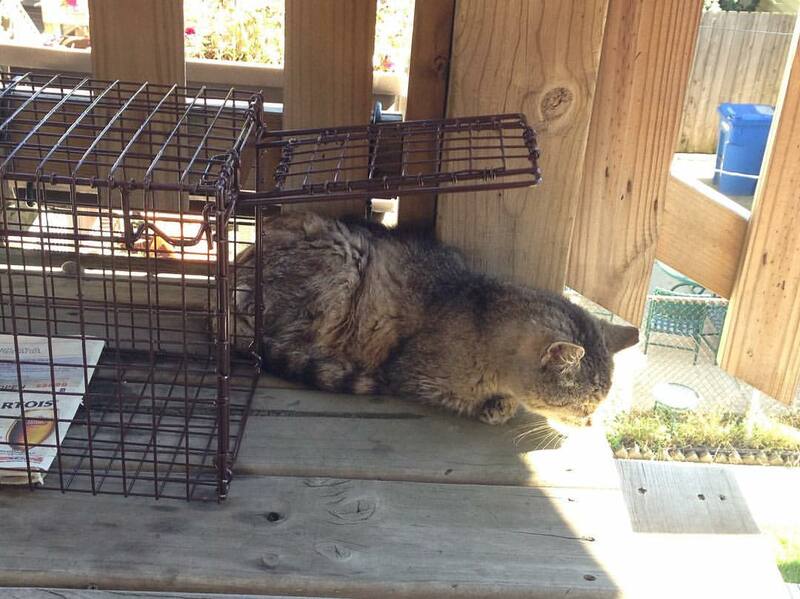 While we were setting up traps in her back yard, we heard the ones in the front yard snapping shut immediately. We trapped five cats that day. Cats started visiting from all around us. This one came by to hang out under my car. Yup, we got her. We set up a Cats In My Yard sign on Melanie’s front gate to explain to everyone what we were doing. It’s translated in Spanish and Polish. We saw A LOT of people stopping to read the sign. Everyone was into it and gave us the thumbs up after reading it, or asked us more questions. 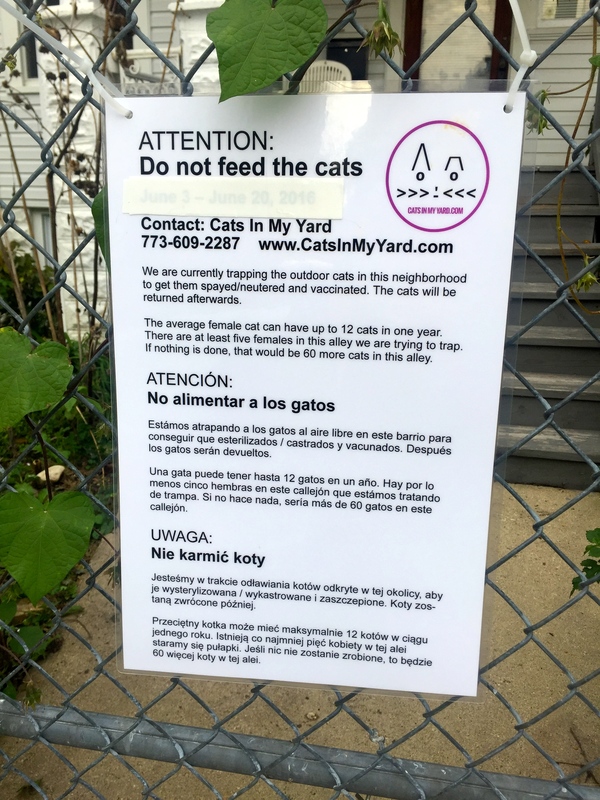 It’s a great way to spread awareness of your TNR project in the neighborhood. 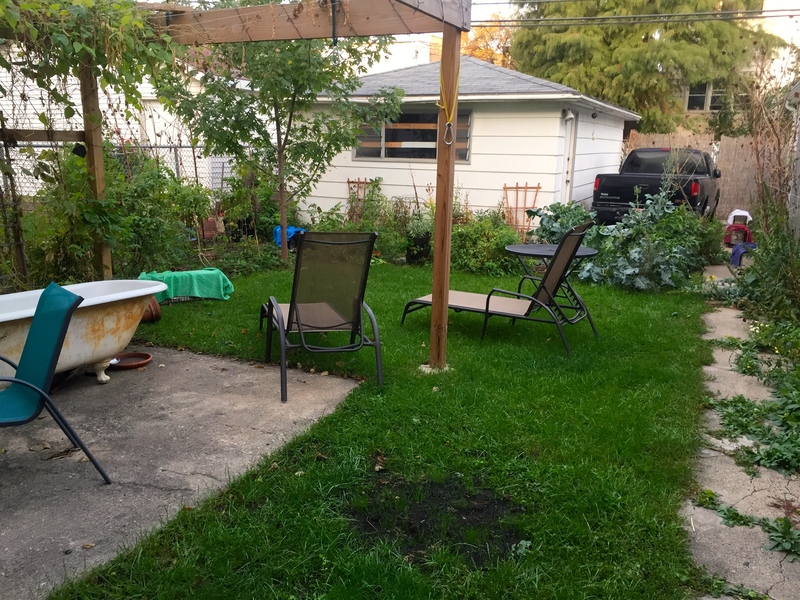 All of the neighbors were into what we were doing, and we have plans to trap in their yards. The elderly Polish feeder came by, and agreed to stop feeding for the weekend. She is also going to show us all of the other places that she feeds cats! The next day we set up traps again at 5am and got another four cats. At this point we had nine cats trapped for TNR. 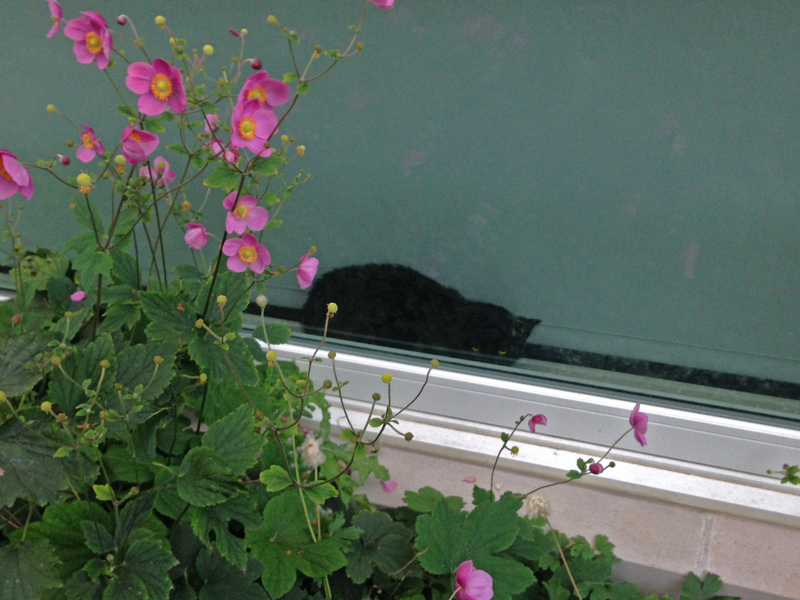 During that time, a little cat came wobbling up to us. Clearly something was wrong with her because she was walking very funny, and we were lucky to trap her. I’ll write more about her and her injuries later. 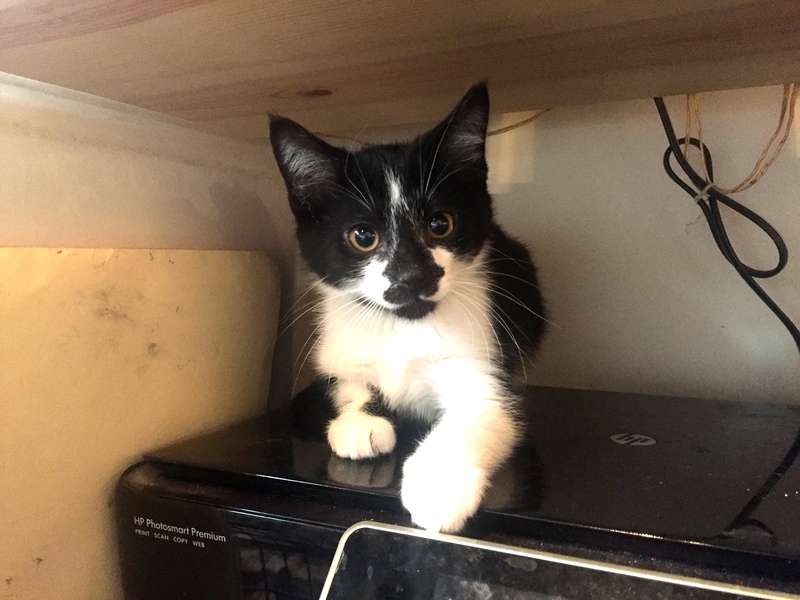 Melanie also trapped the mama cat and found her four kittens in a garage down the street from her with the help of neighbors. 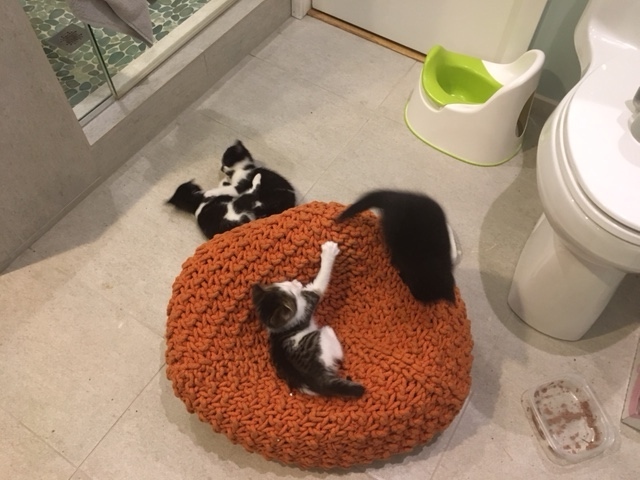 I’ll also be writing about the kittens more later. 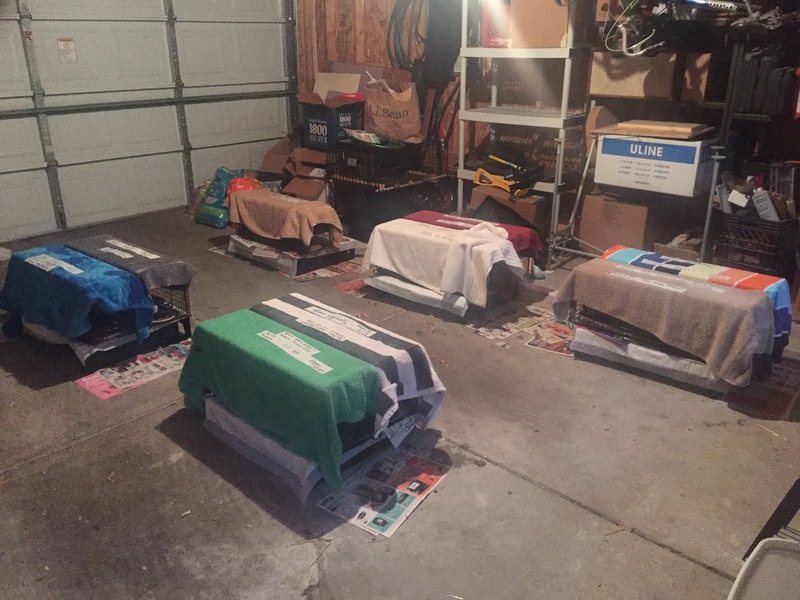 The whole weekend the cats stayed in my garage in their traps in preparation for PAWS Chicago’s low-cost TNR clinic. 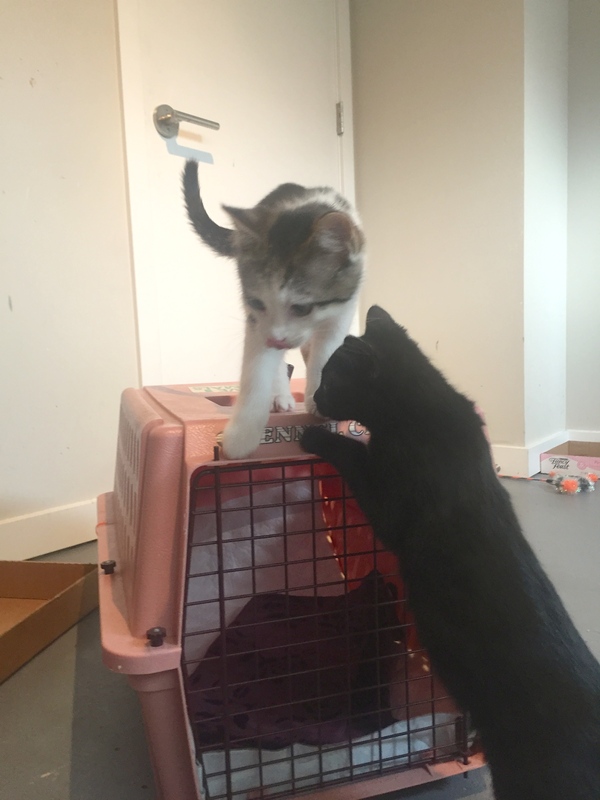 The next day we were ready to bring the healthy adult cats to PAWS. That morning Melanie trapped one last cat, so there were now a total of eleven cats going there. Jim helped us out with transport. 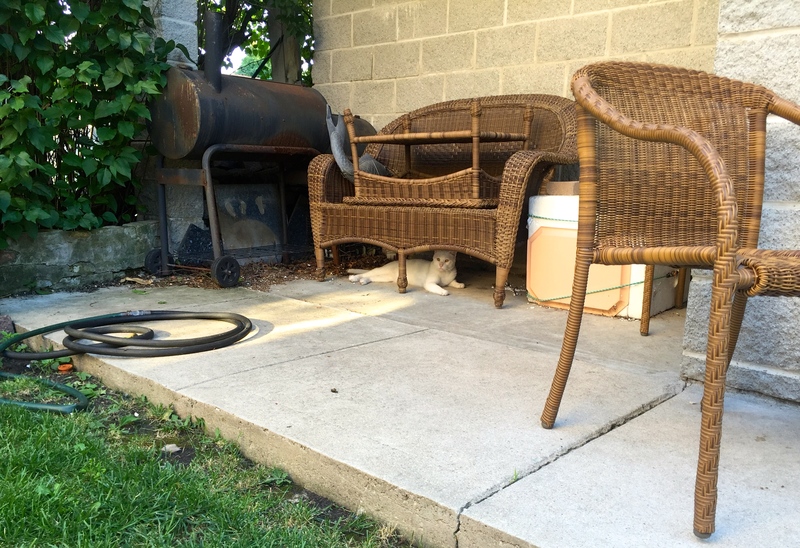 All eleven of these cats were TNR’d, then recovered at Kim’s house, and returned to Melanie’s yard. 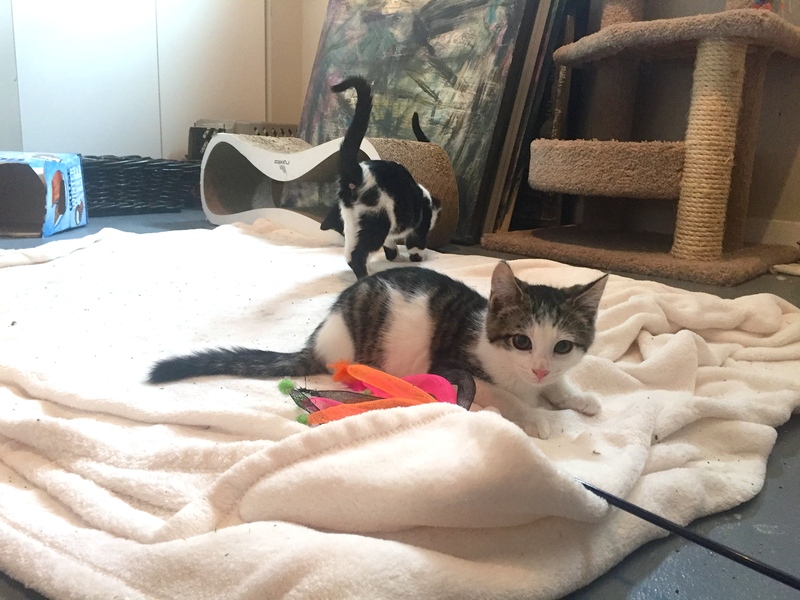 Katler is the gorgeous mama cat, whose kittens are now in foster care for eventual admission into PAWS. 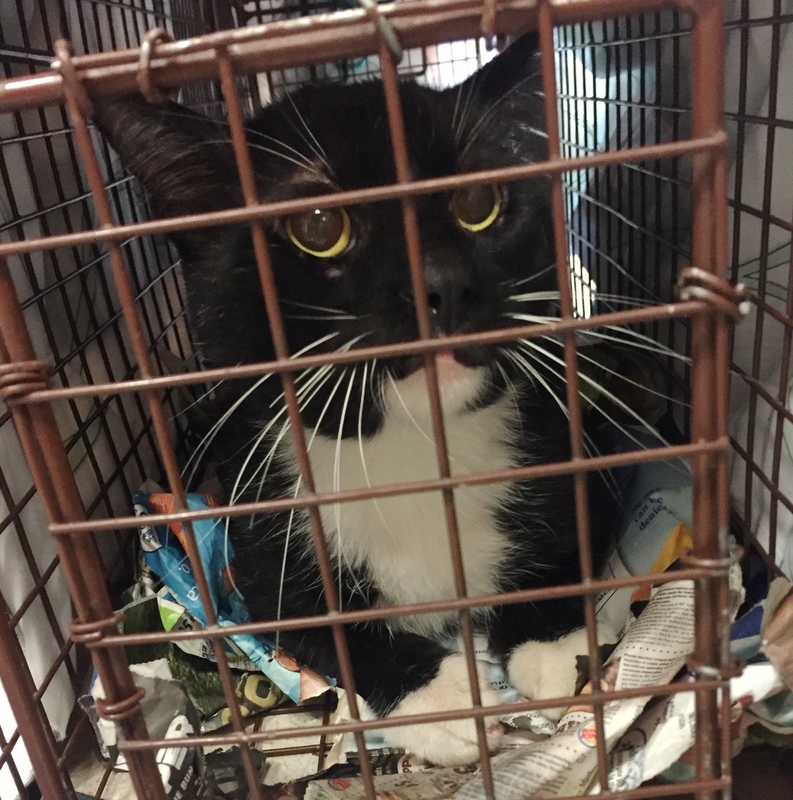 Big Tux Jackson is the big male eleventh cat who was trapped at the eleventh hour at the last minute. 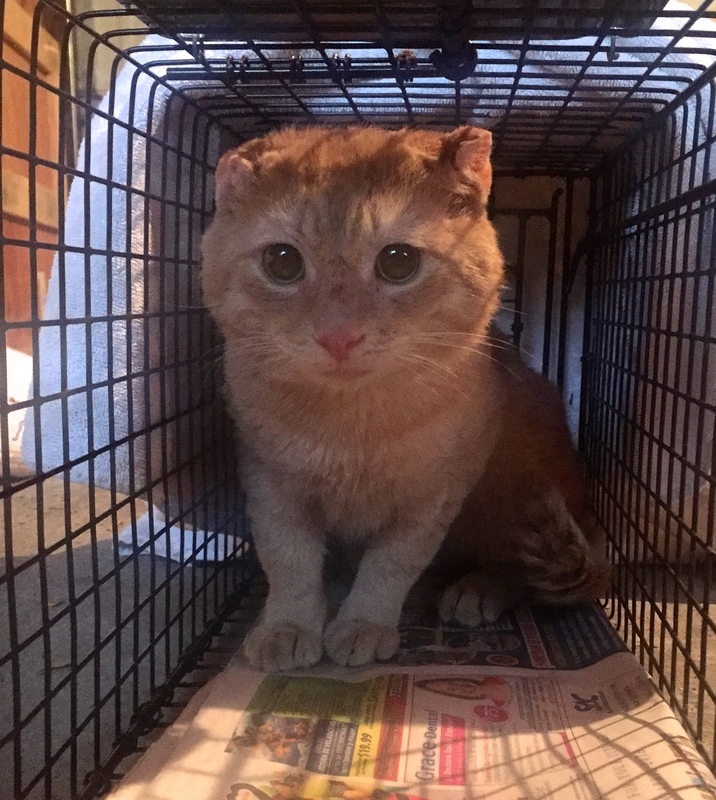 Tommy Two Ears is a fairly friendly male cat who lost most of his ears from fighting, frost bite, or who knows what from being on the streets. 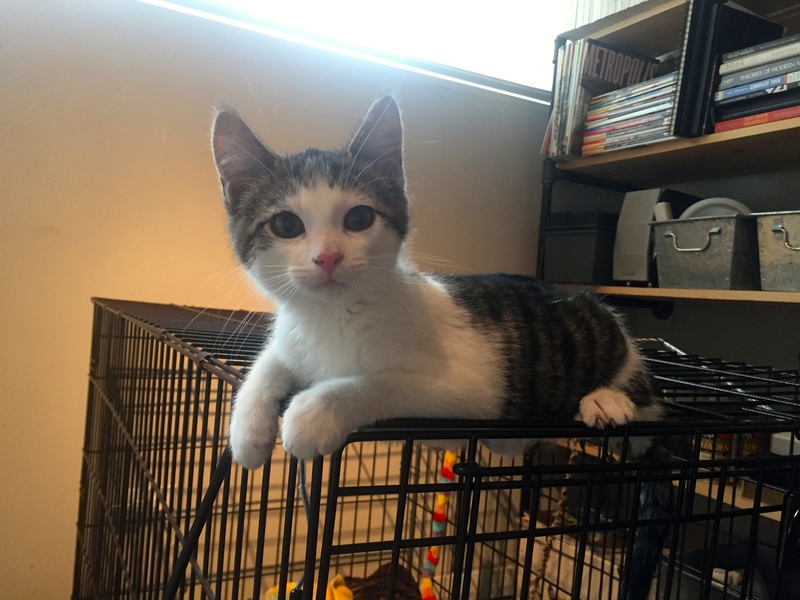 We’ll be keeping an eye on him to see if he’s interested in being in an indoor home – it’s hard to tell for now. 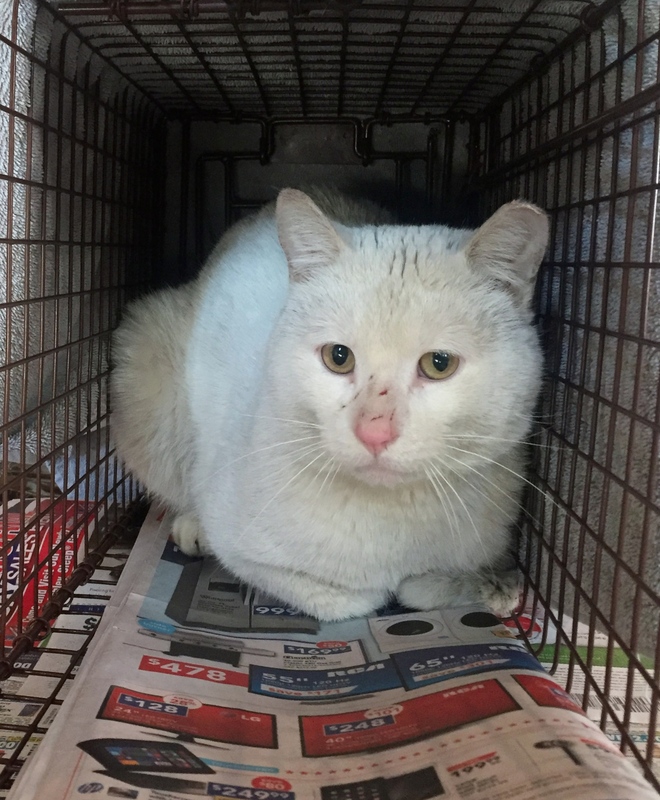 Chinny is another male cat that seems fairly friendly. 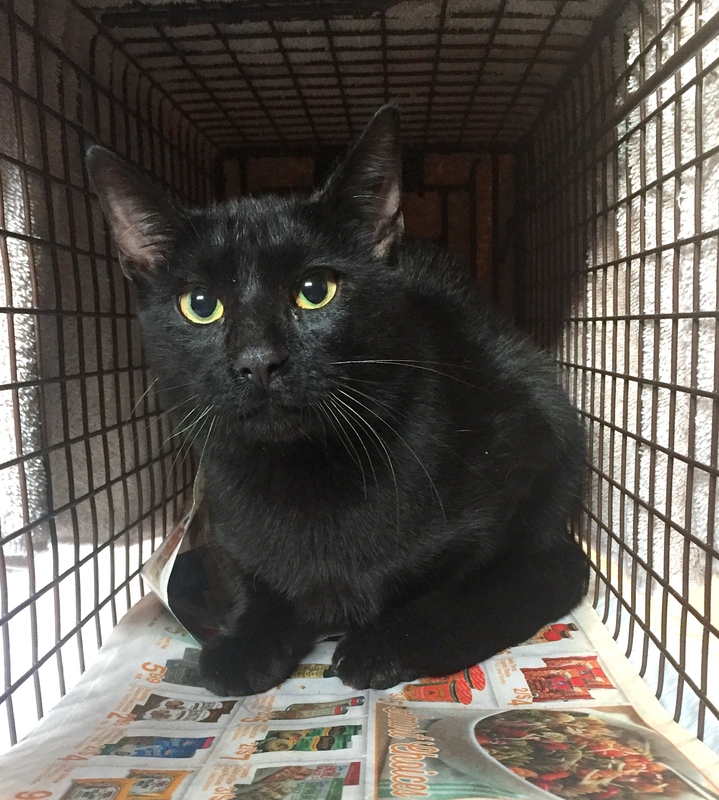 We tested him for FIV/FeLV, and he was negative. 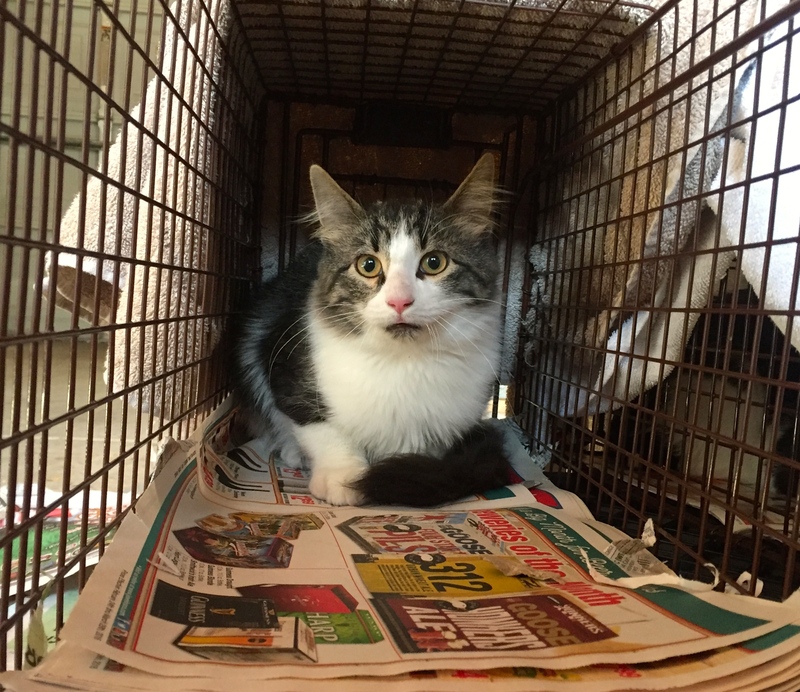 We’ll also be keeping an eye on him to see if he’s interested in being adopted into a new permanent indoor home. Inky 1 is a black male cat, identical to his brothers, Inky 2 and Inky 3. 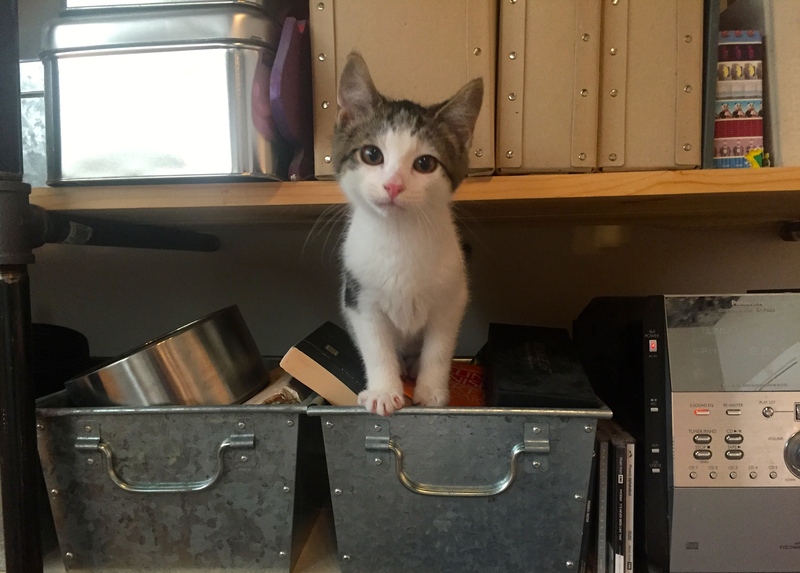 Fun fact: he loves to shred newspapers into tiny pieces, hiss and lunge whenever he can, and emits bathroom deposits in impressively huge quantities. Cleaning his trap while he was in it was quite a comedic endeavor. The funny part was Melanie was well aware that there are three black cats. She just named them all of the same. Here’s Inky 2, also male. And Inky 3, also male. Melanie thought there was one tabby cat, but little did she know there were two. 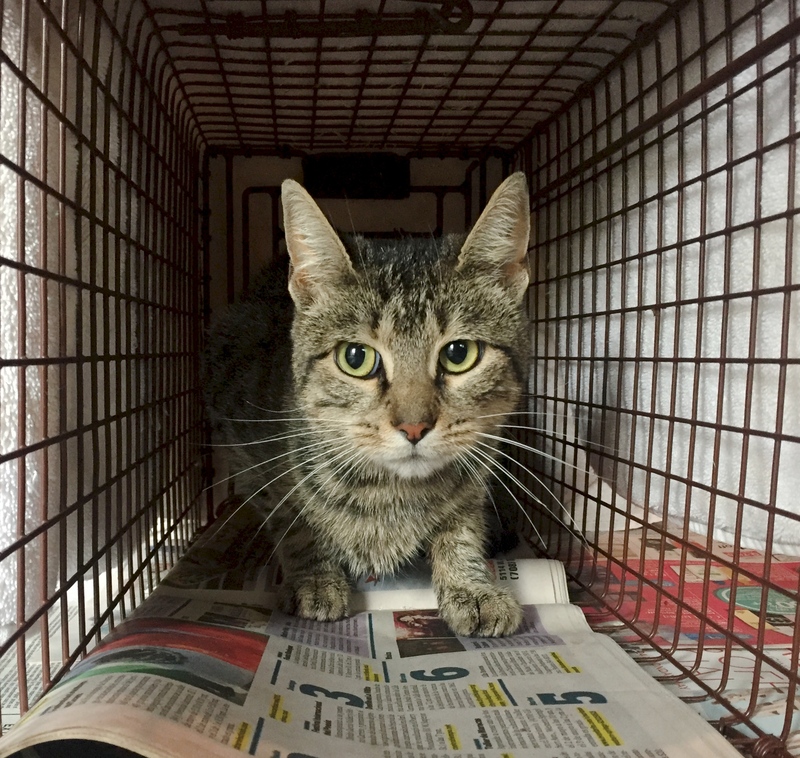 Here’s Wee Tab, a female brown tabby. And Alt Tab, her female brown tabby sister or doppelgänger. 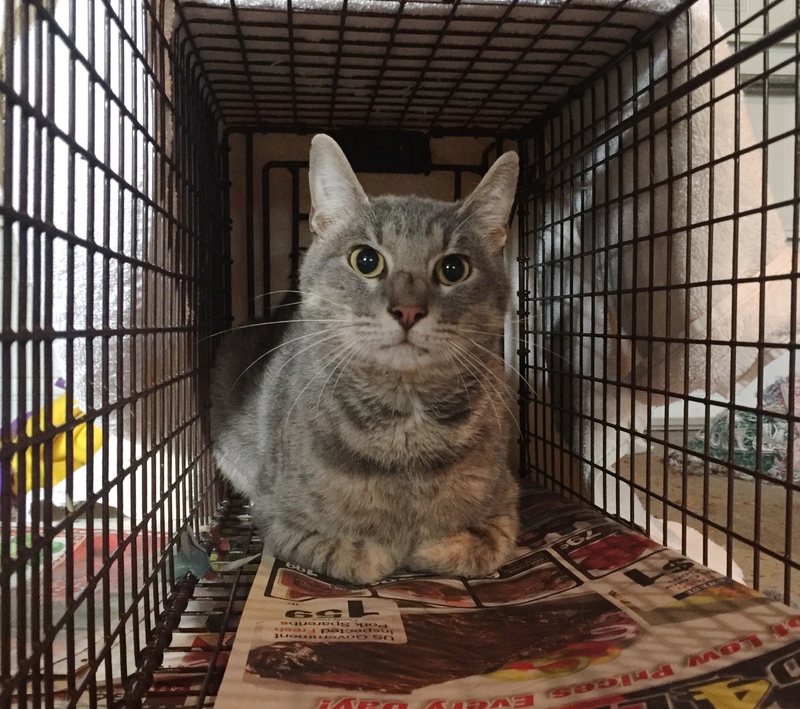 Then check out Big Skinny, a male grey tabby. 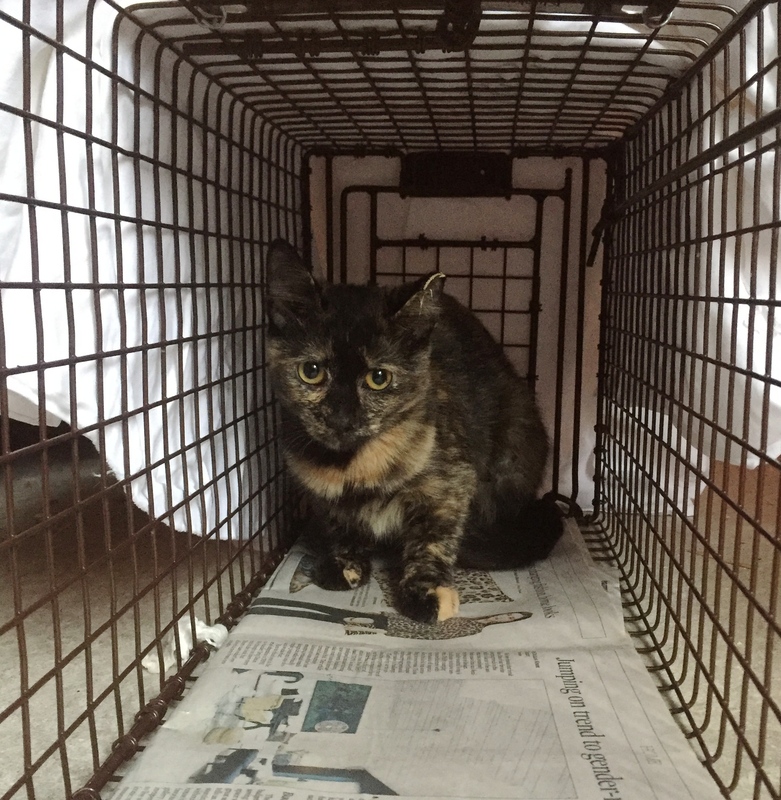 And Little Skinny, a female torbie. Fun fact: this girl ate more than anyone. 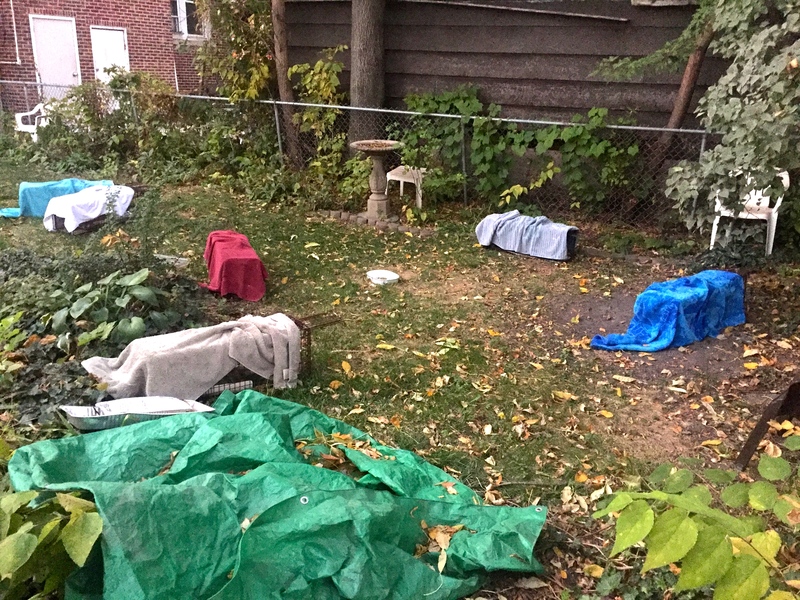 In the meantime, Melanie purchased a few outdoor shelters from Kim for her yard to help the TNReturned colony cats stay warm in the winter, and set up a permanent feeding station in her front yard. 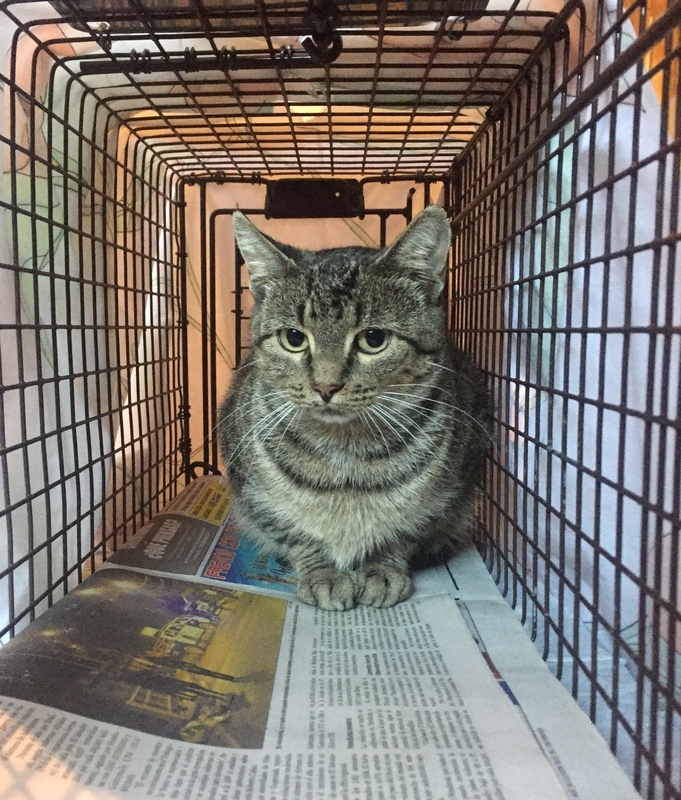 We are excited to continue TNR with Melanie and all of her neighbors on the block. Working with such kind neighbors is a dream come true when you are doing TNR. 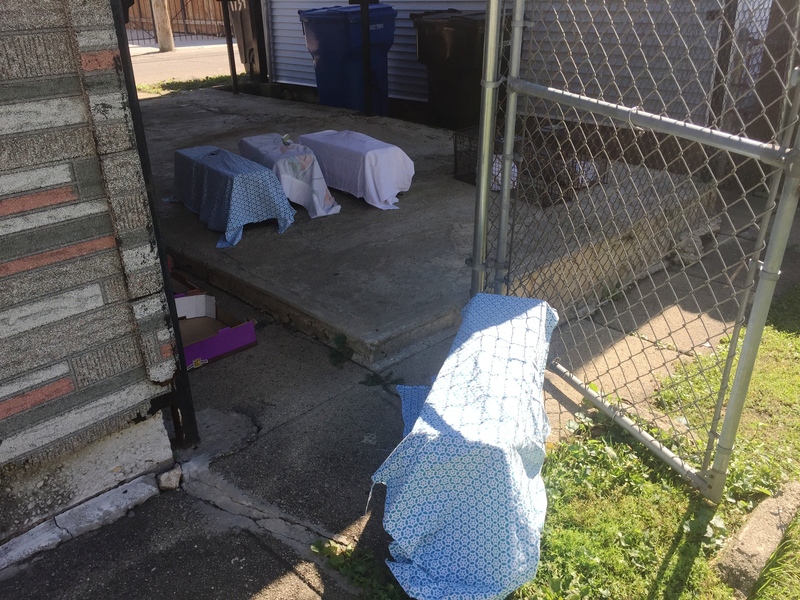 Karen K. contacted me at the beginning of this month about TNR for the cats living in her next door neighbor’s garage in Logan Square. The colony is made up of a mama cat with her four kittens, although the kittens are now already almost grown. Karen was worried about the cats because neighbors were complaining about them pooping in their yard, and that there would be more litters soon. After making sure Karen was feeding the cats on a schedule, she stopped feeding for a day or two. Kim and I started trapping them last Saturday, meeting up at 6am to set up and bait the traps. This is the garage with a huge hole on its side that the cats all live in. 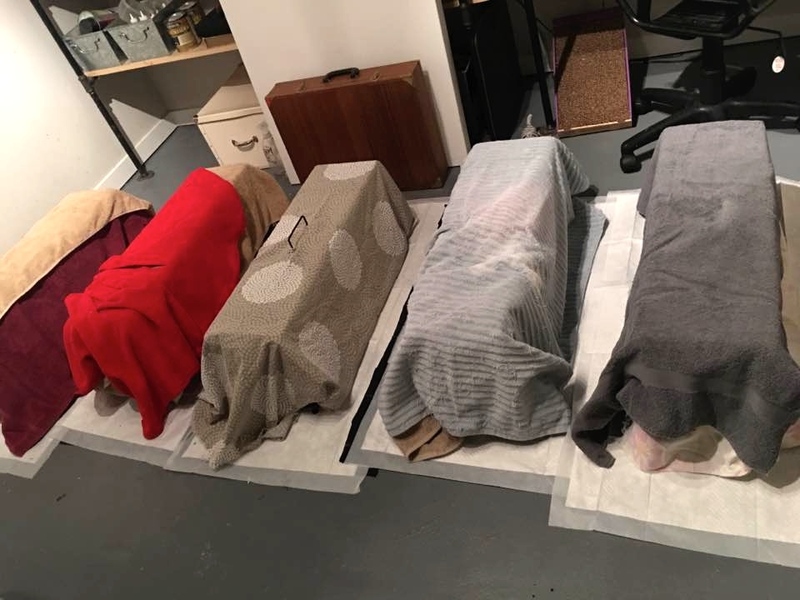 Throughout that day, we trapped all five of the cats. At one point, Karen even trapped a black squirrel, and let her out. I would’ve loved to see that! 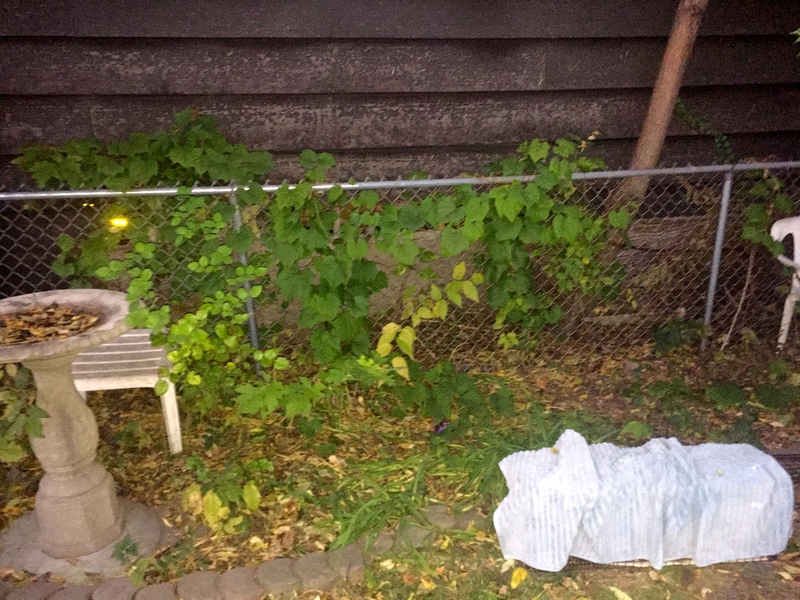 We kept trying to trap early Sunday morning before PAWS’ clinic opened to get them TNR’d, because we knew obviously there is a papa cat out there. 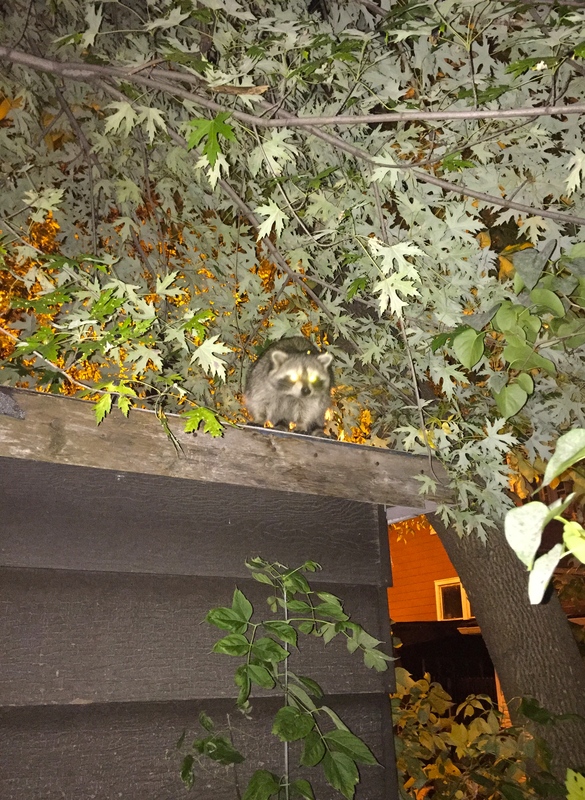 When I showed up at 5am on Sunday, a raccoon appeared on top of the garage above my head. This raccoon was bold! He climbed down and kept trying to go in the traps as I was baiting them with sardines. 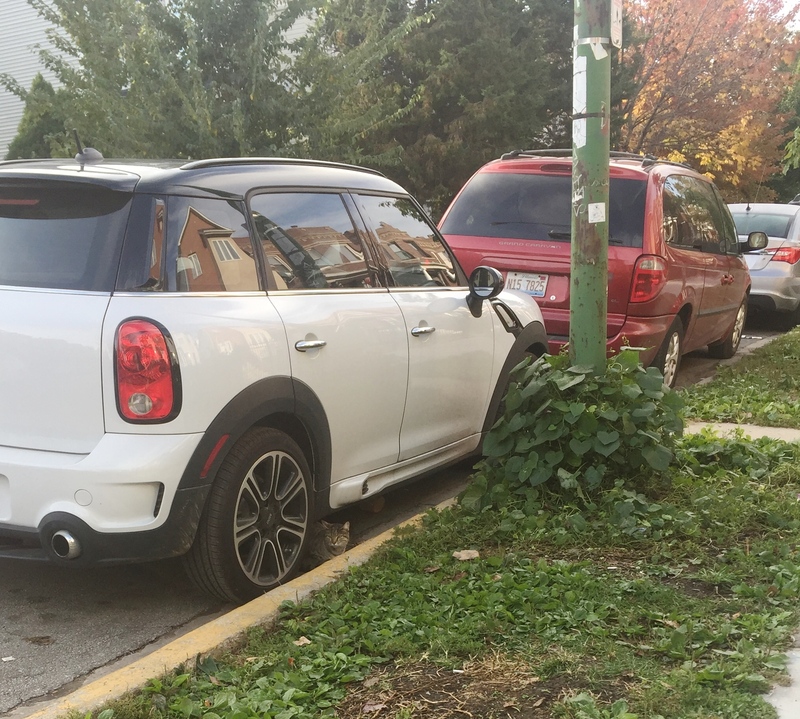 I’ve never seen anything like it. When Kim came to check on the traps later all of the sardines were gone, but the traps were still open. The raccoon knew how to eat the bait without setting off the traps! In the end we still had five cats ready for their TNR treatment at PAWS’ clinic. Queens is the beautiful queen mama cat. And then we trapped the rest of her family. Here is Manhattan, female. And Harlem, the one male. He would’ve had quite the harem if this colony was not TNR’d. 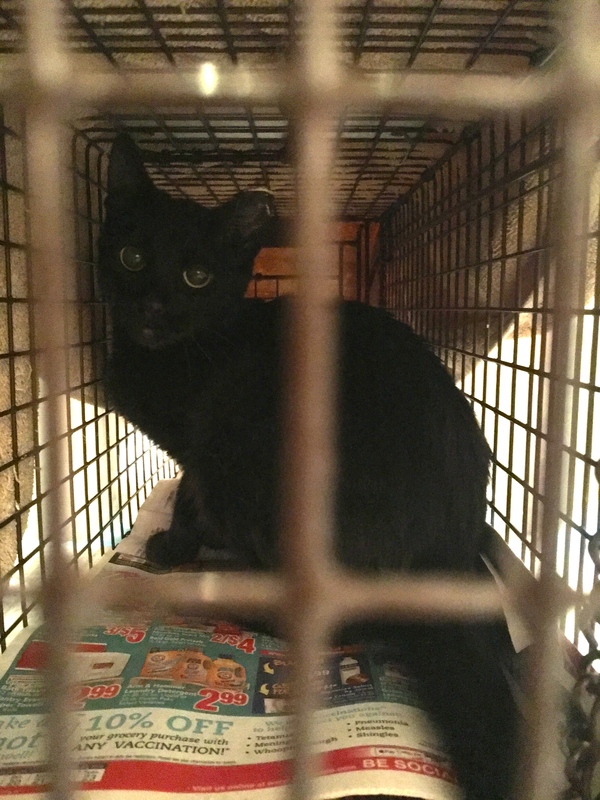 All of the cats went to PAWS’ clinic for TNR last Sunday, and have been recovered and TNReturned. Karen will let us know if any other cats show up in this area. So fun to see all your cats and adventures! Thanks for sharing! 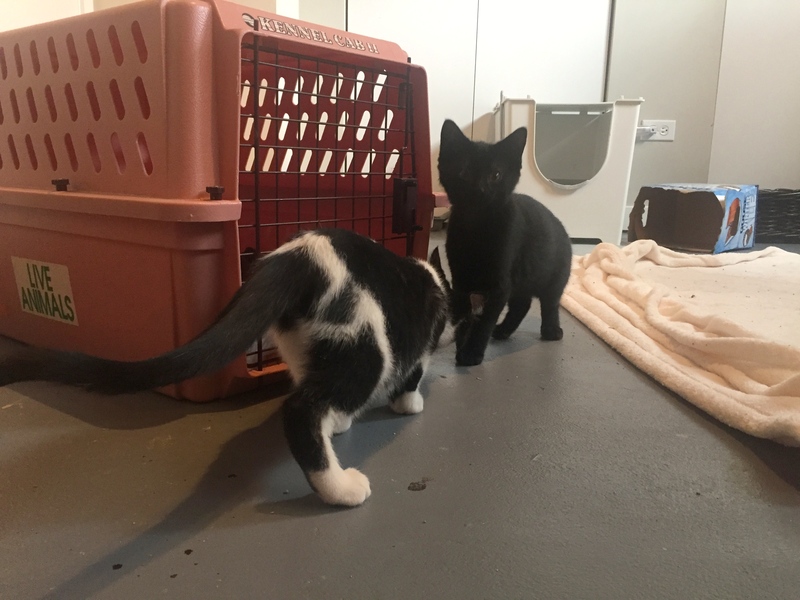 Twelve cats and kittens were trapped at the Catalonia Colony in one alley so far. 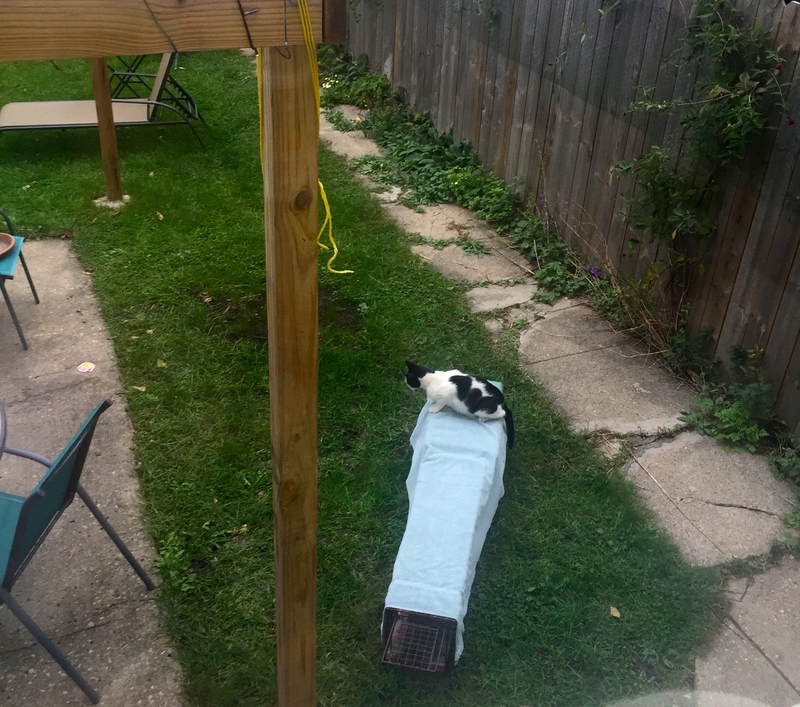 Oleksandra and Kim volunteered to help a TNR request from PAWS Chicago for this colony cared for by Bonnie, a feeder in Hermosa. There are A LOT of cats in Hermosa – it kind of reminds me of how my neighborhood used to be a decade ago. Joann and I also then joined efforts in trapping, transporting, recovering and returning the cats. 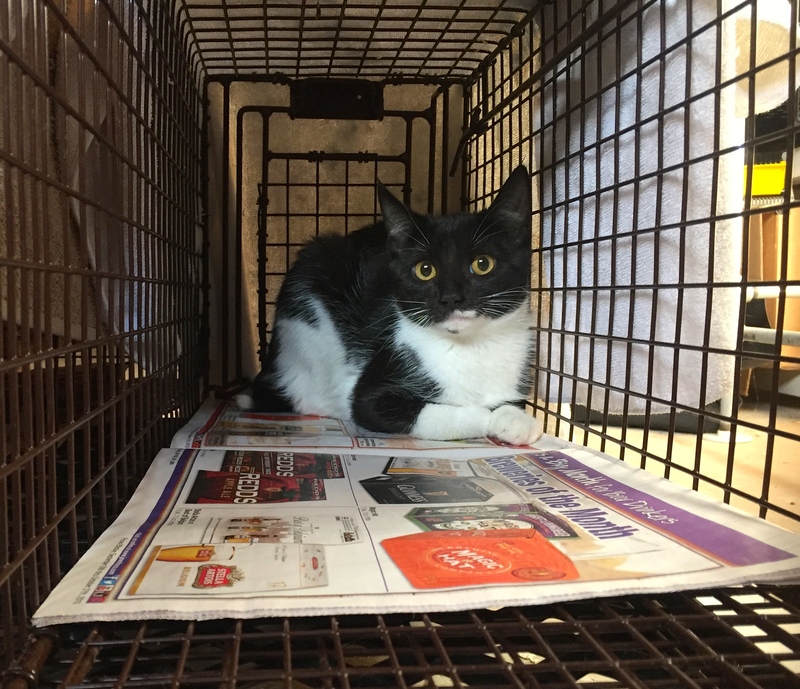 Jenny N., the clinic director of PAWS, also continued to help us with transporting the cats back and forth from the clinic. We are very grateful for all of her help this year! 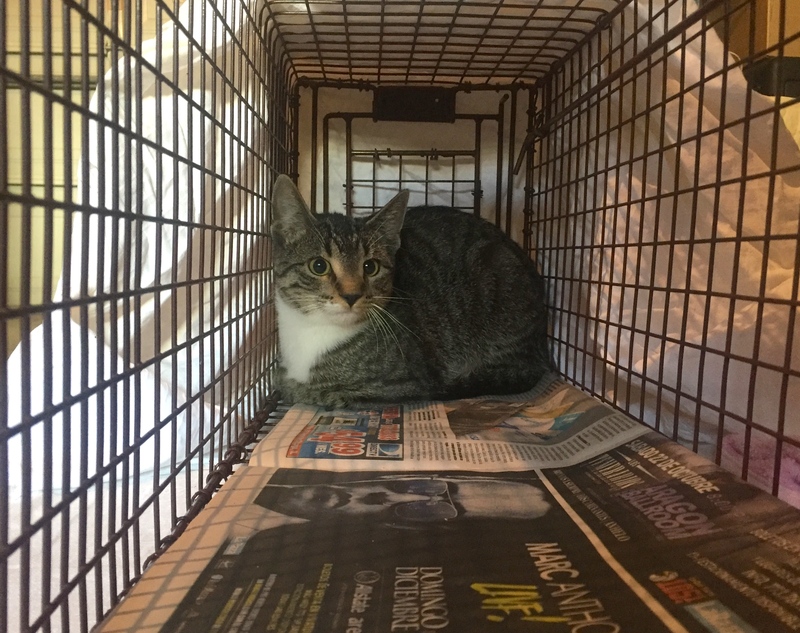 The entire colony that Bonnie knows about are now all spayed/neutered, but we know there are more cats out there and will continue trapping. 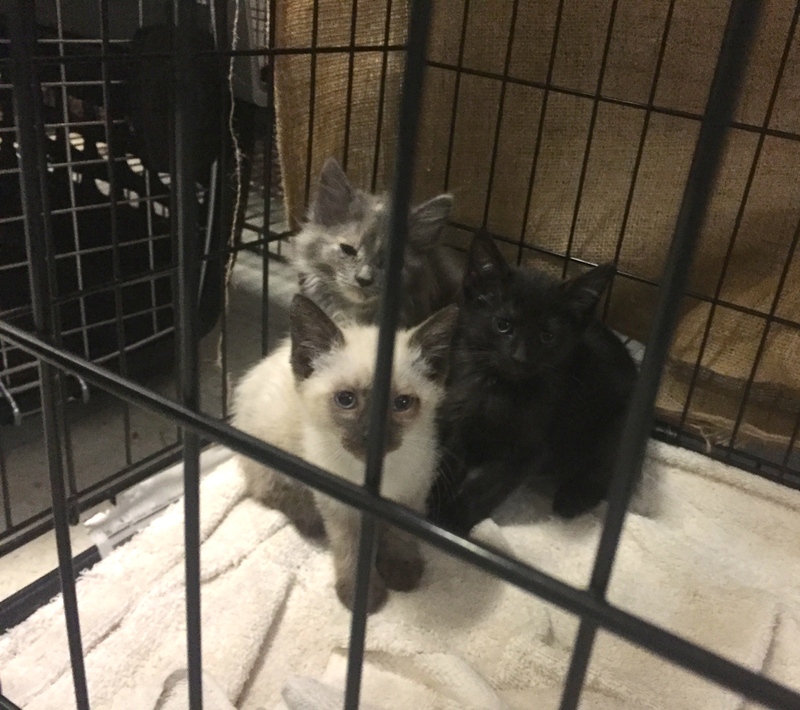 The three kittens were immediately admitted to PAWS Chicago. 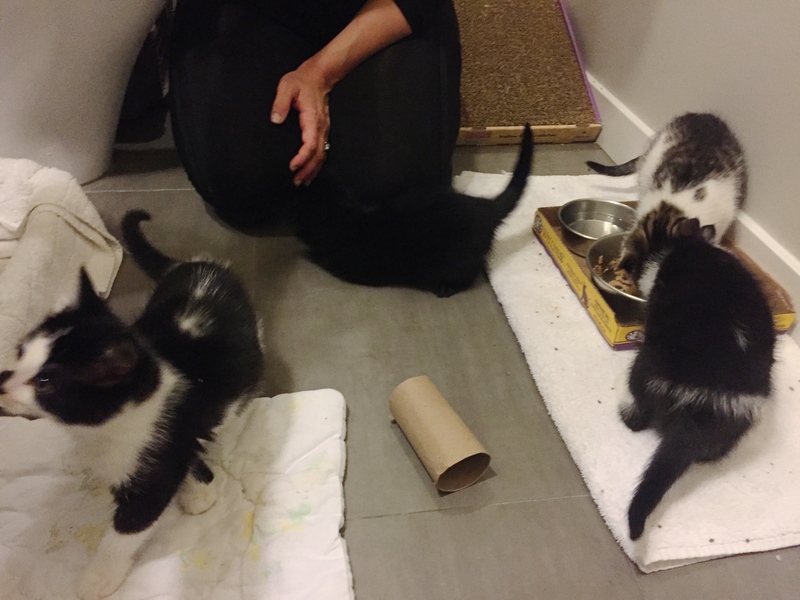 They were trapped first, along with some adult cats, almost all of them feral. This photo shows Kim’s recovery room. Catalonia is in one of these traps, and we named this colony in honor of him because of all of the hilarity – ahem, I mean worry – that he put her through. Catalonia managed to get out of his trap, and spent a few good days loose in the room. He was absolutely fine, but it took some time to get him hungry enough to go back in the trap on his own. One of his favorite spots during those few days was hanging out in the window. Once he was trapped again, he was TNReturned and very happy to be back with his siblings and bonded friends in the colony outside. Bonnie thinks Barcelona was the mama cat of the kittens. It makes sense, as she was so frantic to get out of the trap, that she rubbed her nose raw against it. Barcelona also has an issue with her right eye. PAWS kept her for observation for a few days in a dog crate, and then decided she was healthy enough to be returned outside. 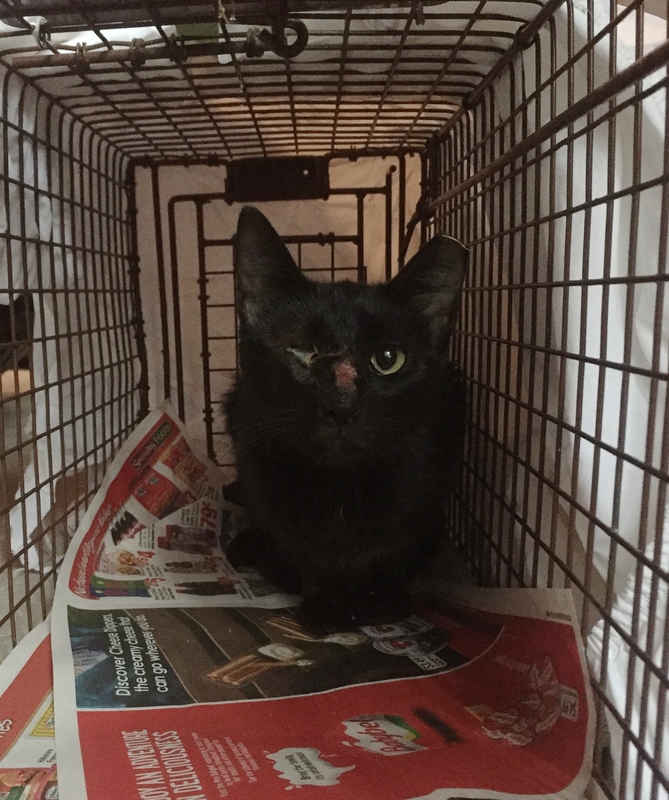 Per the head vet at PAWS, she is already losing that eye, and the lid is slowly closing over it. It is not causing her any pain. Should she show signs of any infection or anything else in the future, Bonnie will call us and we will re-trap Barcelona for further treatment. Madrid was a pregnant female, TNReturned. 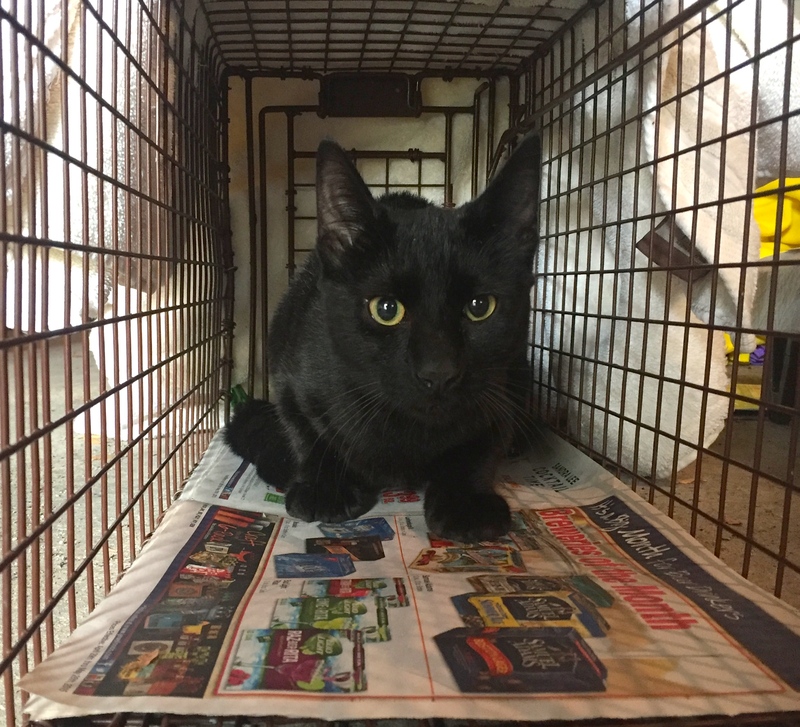 Seville is just one of three male cats from here, now TNReturned. Along with Bilbao. He was seen further down the block from Bonnie. And was trapped easily. 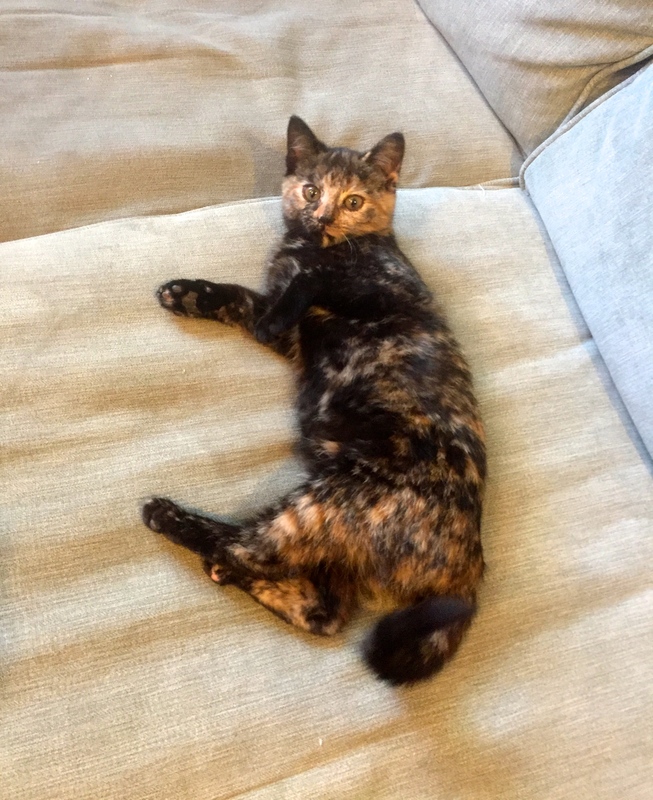 Valencia is a tortie, so obviously she is female, now TNReturned. Lugo is another female cat trapped a few days later. Bonnie is so grateful to have all of the cats back. They live in her beautiful, clean yard where she feeds daily and has shelter for them under her front porch. Kim also purchased additional Rubbermaid bin shelters for her. 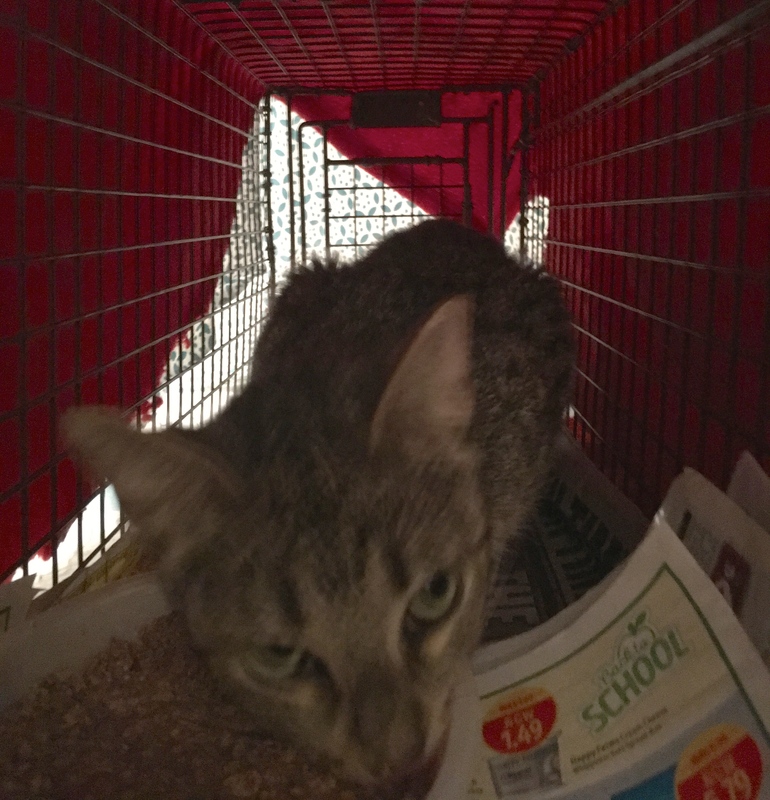 I returned the cats back to Bonnie’s car port, where the cats shot out of her traps straight into her yard. 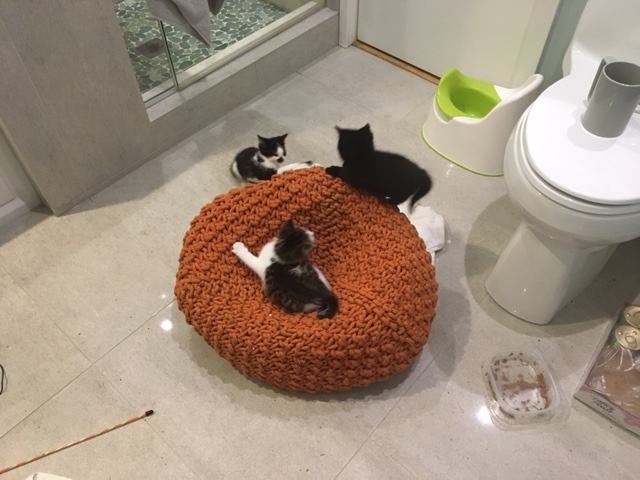 We were told that there are four more kittens further down the same block. 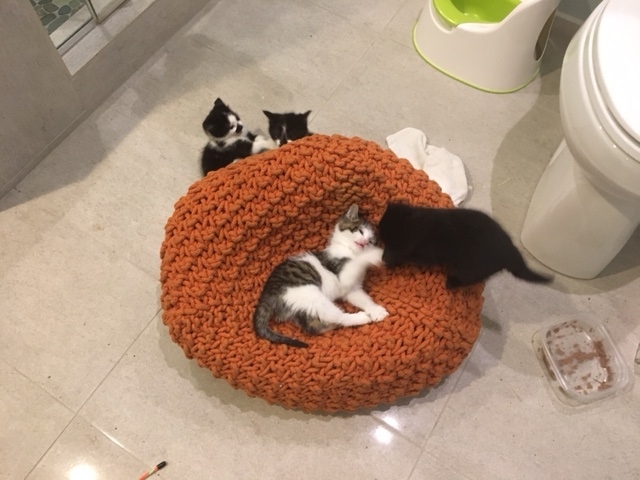 Just a few days ago Oleksandra trapped this calico while looking for the kittens. 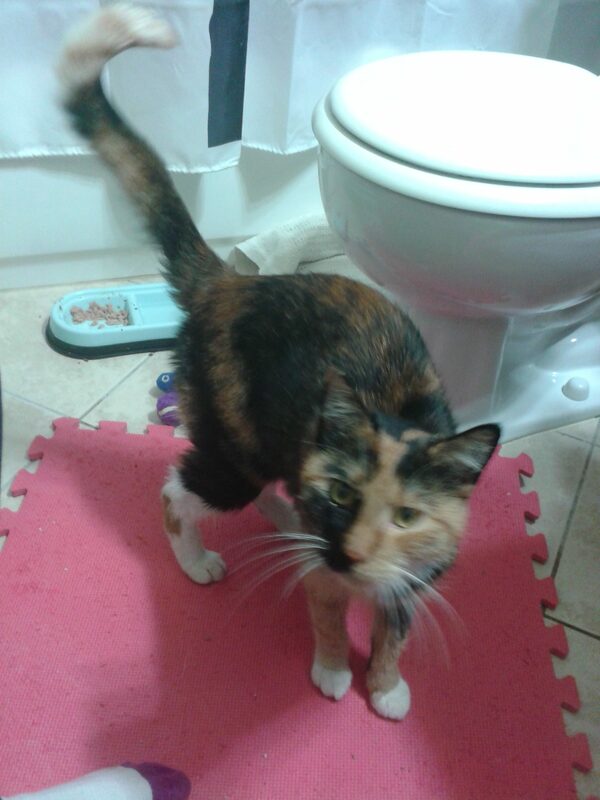 The calico is obviously friendly so Oleksandra put her in her bathroom before taking her to PAWS. At PAWS they found out she was already spayed. They gave her a microchip, updated her vaccinations, and tested for FIV/FeLV in case she would be admitted for admission. She tested negative. Oleksandra went door to door on that block and found her owner! 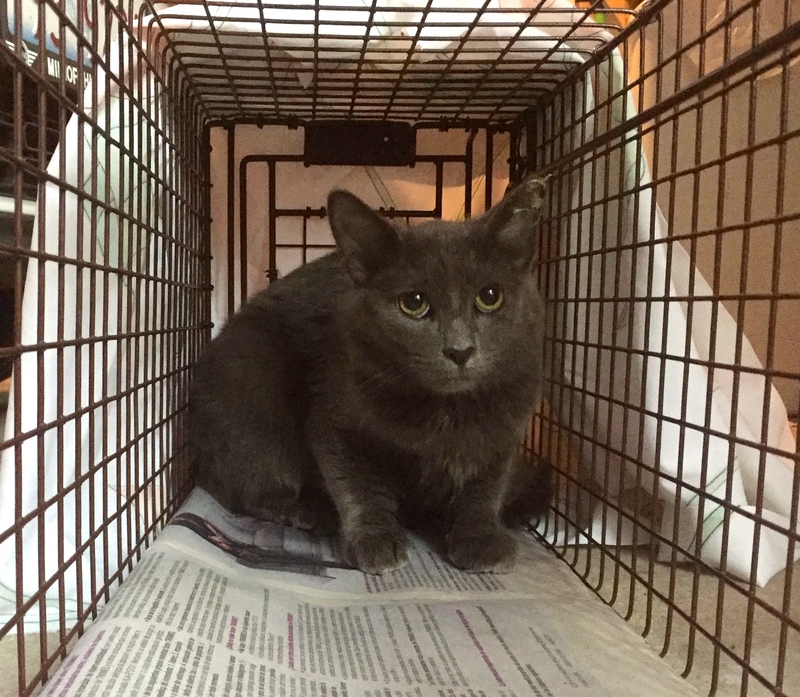 The owner said her name is Marigold and she has two other spayed/neutered pet cats. They are all now reunited. 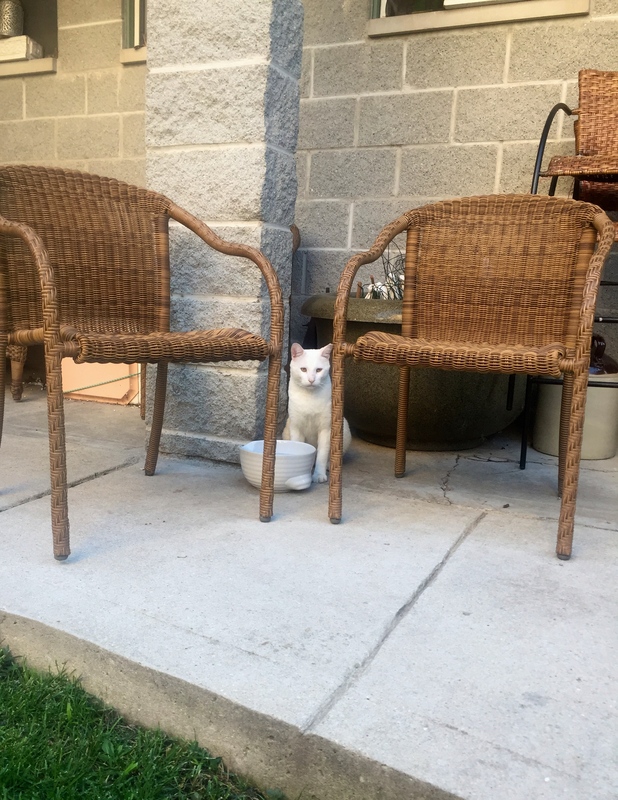 “so there’s a feral cat, a sweet old man, who lives on my block. i think a neighbor across the street usually feeds the colony, because i see them hanging on his porch a lot. the old man cat seems like he’s really sick. his nose is all crusted and he’s on my back porch right now, seeming like he has a bit of trouble moving. he’s just hunched there, breathing heavily. i know not to touch him, because he’s definitely an ear-tipped feral. i tried to make him comfy, brought him a little bit of food. he sat up when i got near him, but did not run, which is one of the ways i know he is not doing well, because he used to run when i got within 30 ft orso of him. 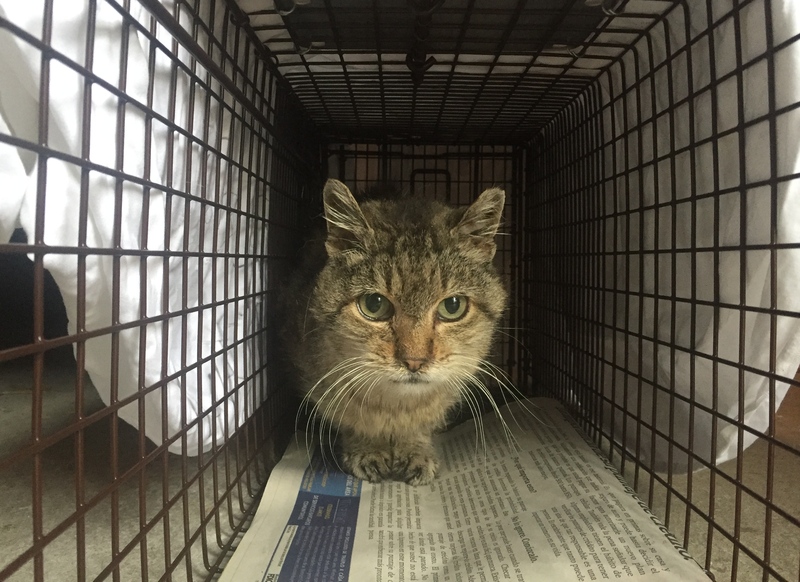 i don’t have the money to pay for medical attention for him, and i’m not sure if it’s even a cause worth fighting for because he might just be old as hell and withering with age. Joann and Kim brought traps to Atticus. Atticus and his girlfriend, Katie, watched the traps day and night. 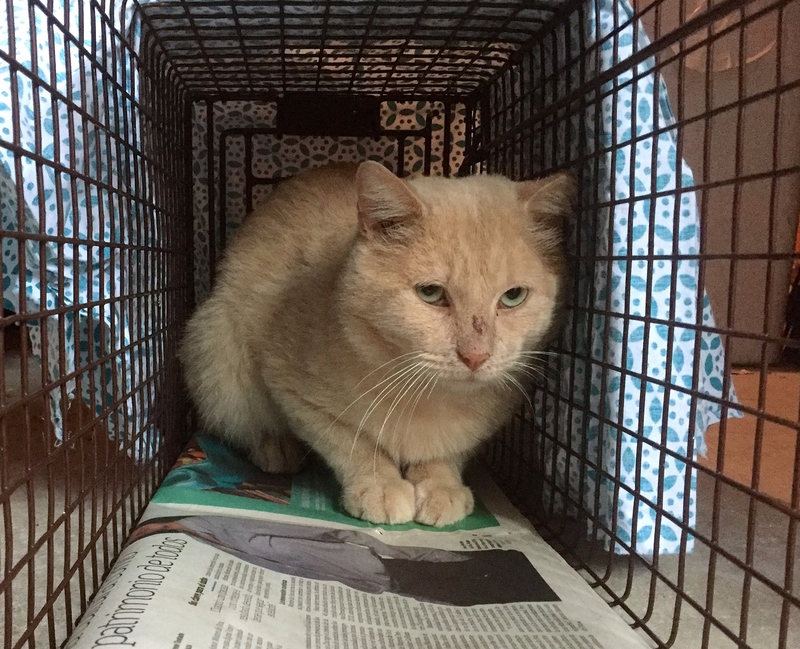 This sick cat would come and go, and sat by the trap for a few days. 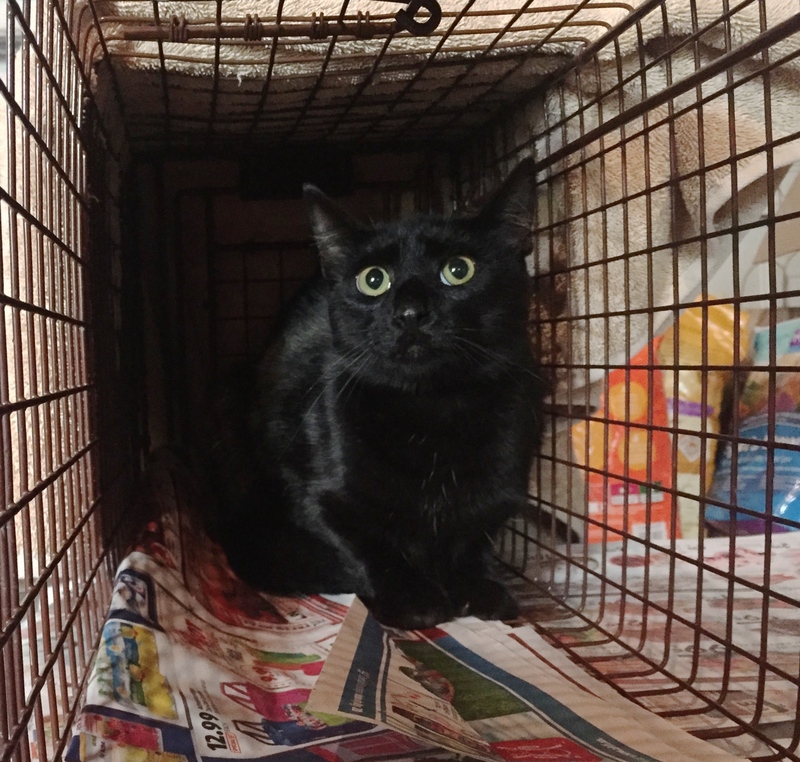 In the meantime, they trapped another black cat. 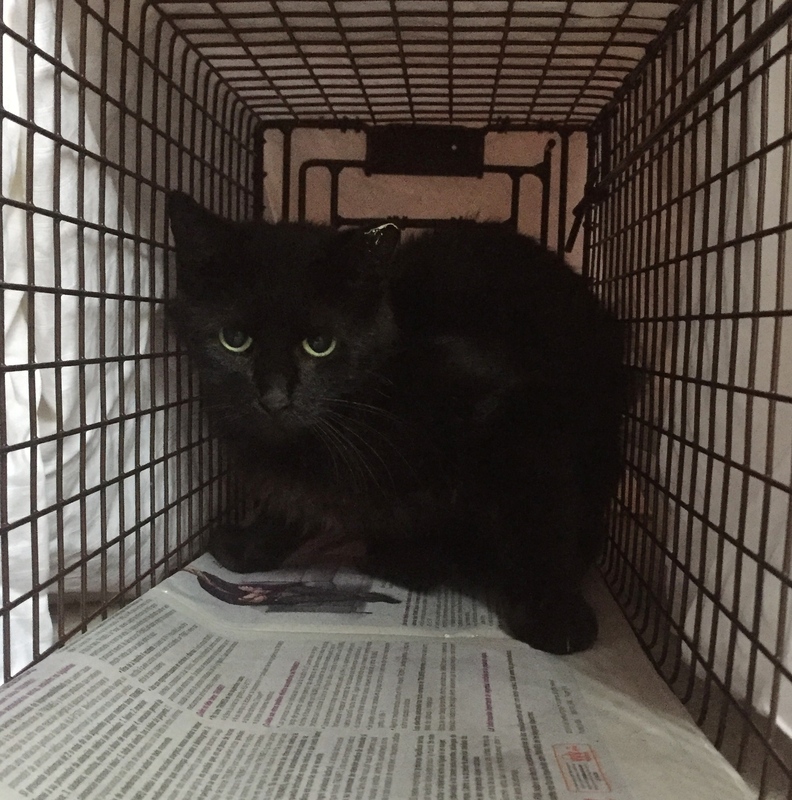 They named her Ditto, and she received her TNR treatment at the Anti-Cruelty Society’s clinic. Finally, after a week of setting traps, the sick cat went in. 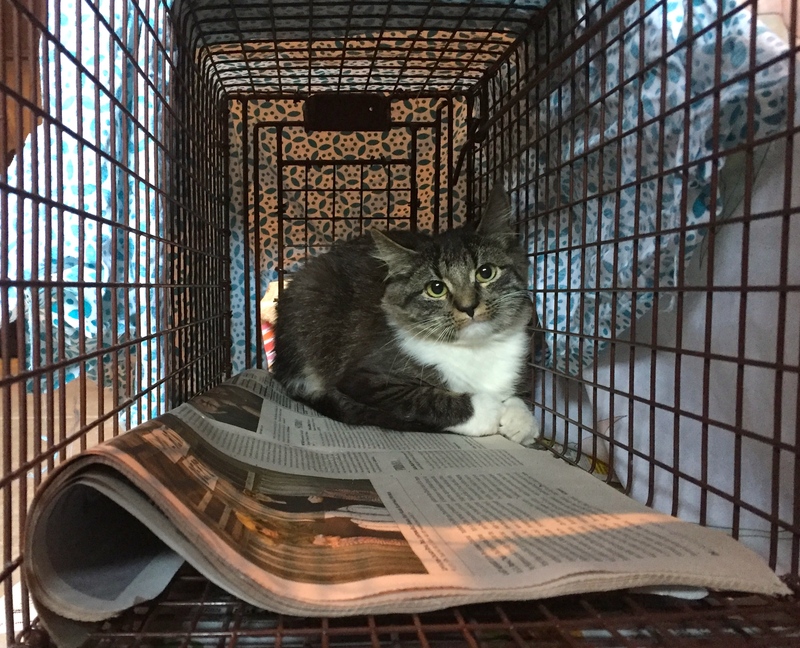 In the meantime, PAWS let us know that she was TNR’d in 2010 on the same block we trapped her. Her name was Stacy. The person who TNR’d her has since moved from the block. She was the only cat she ever TNR’d because Stacy kept having litters of kittens. But Stacy had other feeders caring for her since then, including Atticus, and his neighbor across the street. 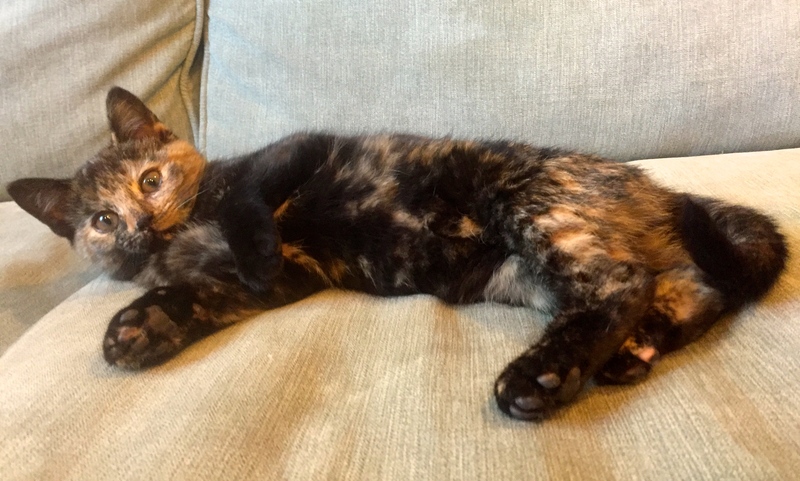 The next day Dr. Harris informed us that she tested negative for FIV/FeLV, but her bloodwork results were dismal. She would need ongoing daily medication and care for lymphoma, most likely. This was just not possible in her situation and Stacy was already very sick. She was acting very lethargic, barely moving in the dog crate, yet very scared and stressed at being confined. 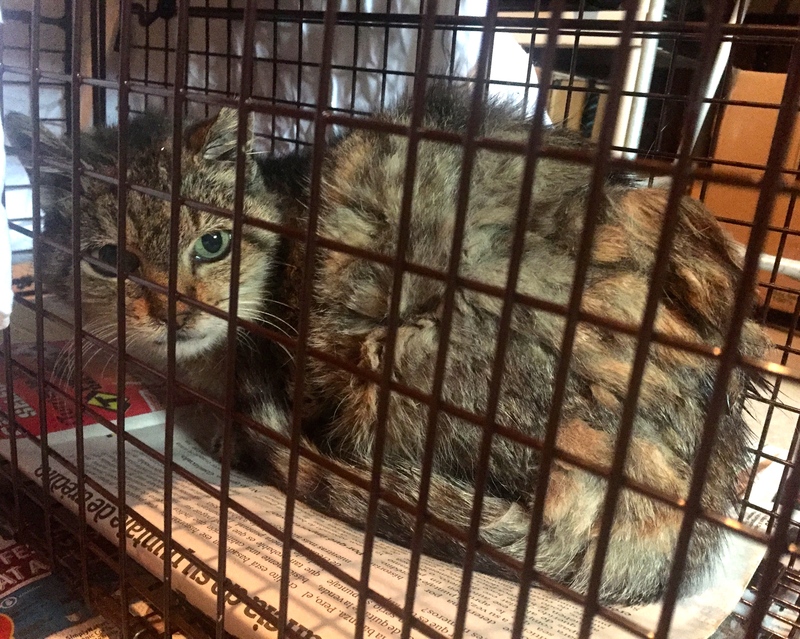 At the same time, if we put her back outside, she was not in a situation where she stayed in a single place and could take daily medicine and daily care. Winter was coming and the cold would eventually kill her. After much discussion between all of us, Jenny N. at PAWS offered to take her to their clinic and euthanize her. RIP, Sweet Stacy. You were surrounded by love at the end of your life, and brought a lot of people together who tried to help you the best way we could. 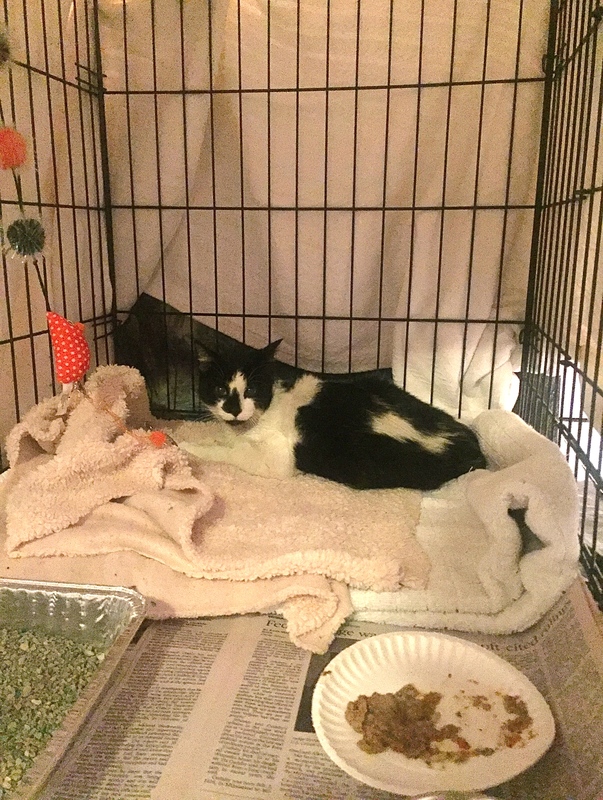 We are so grateful for the compassion of Atticus and Katie for caring for her, for reaching out to the local Everyblock community, and to the vet care from Elmhurst and PAWS. 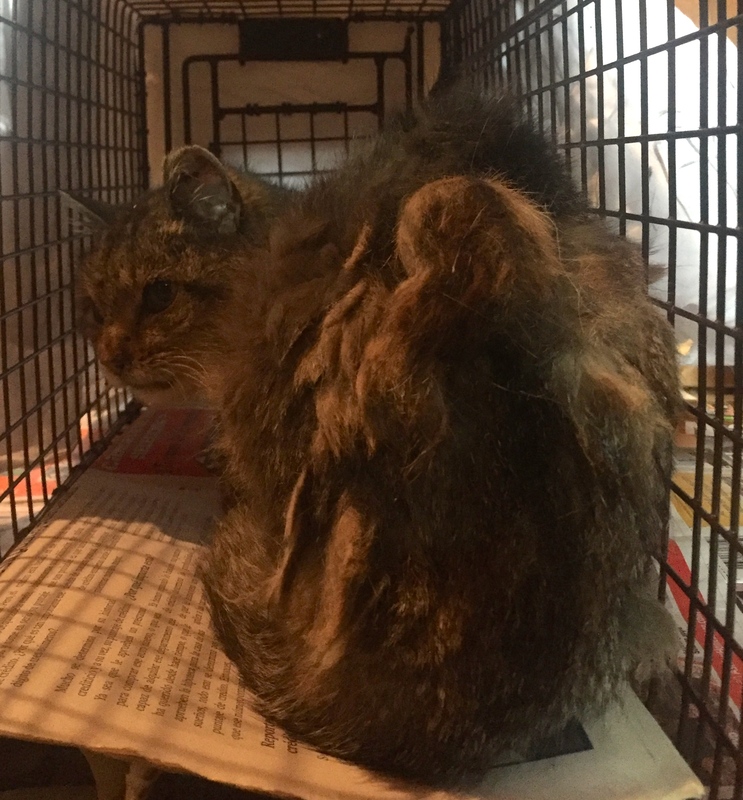 Every animal deserves a dignified and humane death when they are suffering, and this is why we provide that care as best as we can to the colony cats.